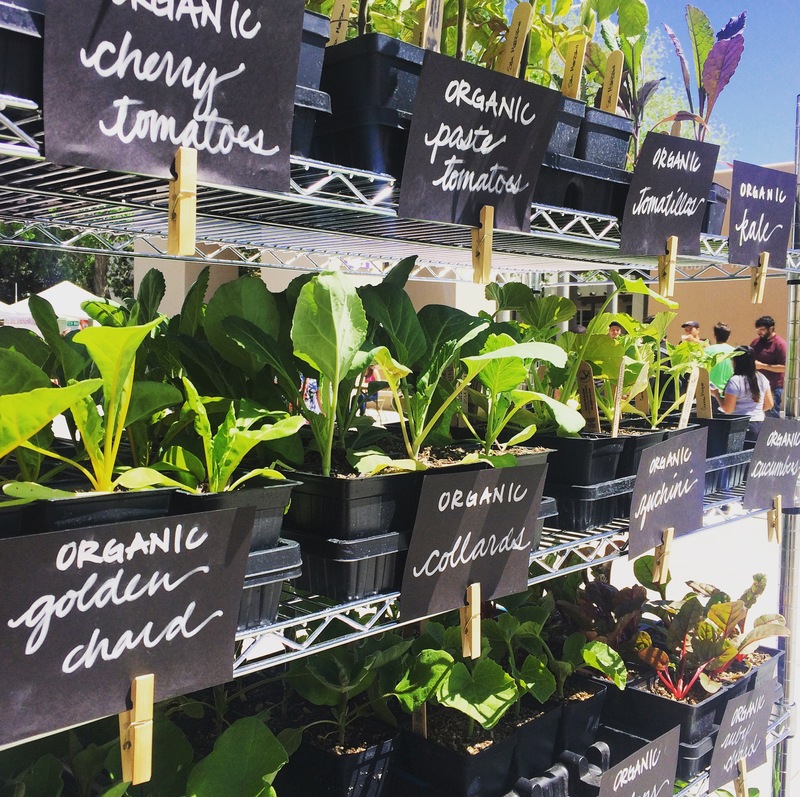 We kicked off this year’s market season with another intense series of events—opening day at Downtown Growers’ Market, the Sustainability Expo at UNM, and La Montañita’s Nob Hill Earth Fest. After a long few months being holed up down here working, building, talking to plants, and fretting over the bank account it was SO GREAT to see all the folks we’ve been missing, and have the money flowing in a much more exciting direction. And it’s so fun to send our little plants home with people to start their gardens! And after that whilrwind week, it only took two solid days of vegging out and soaking in gratitude to be ready to get back to work. 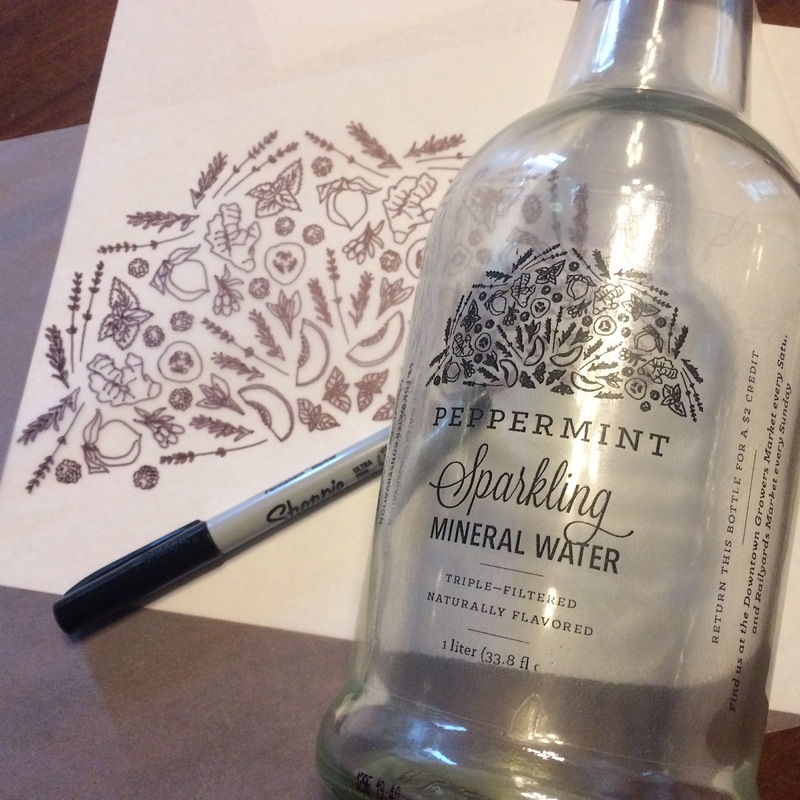 Sparkling Flavored Water is Launched! After a whole lot of permits and paperwork and a few struggles with our new kegs and carbonating system, we finally debuted our flavored sparkling water. We brought two delicious flavors—Peppermint and Lavender—to the first market and they were a great success! I’m obviously partial, but I’m completely hooked. They’re so fresh and yummy. They just taste of plants in the most true and delightful way. We have a batch of Rosemary brewing to add to the selection tomorrow, and it is super tasty, too! With the exception of the liliaceae, the last trays of plants stuck imprisoned in tiny plugs have been bumped up to larger pots. 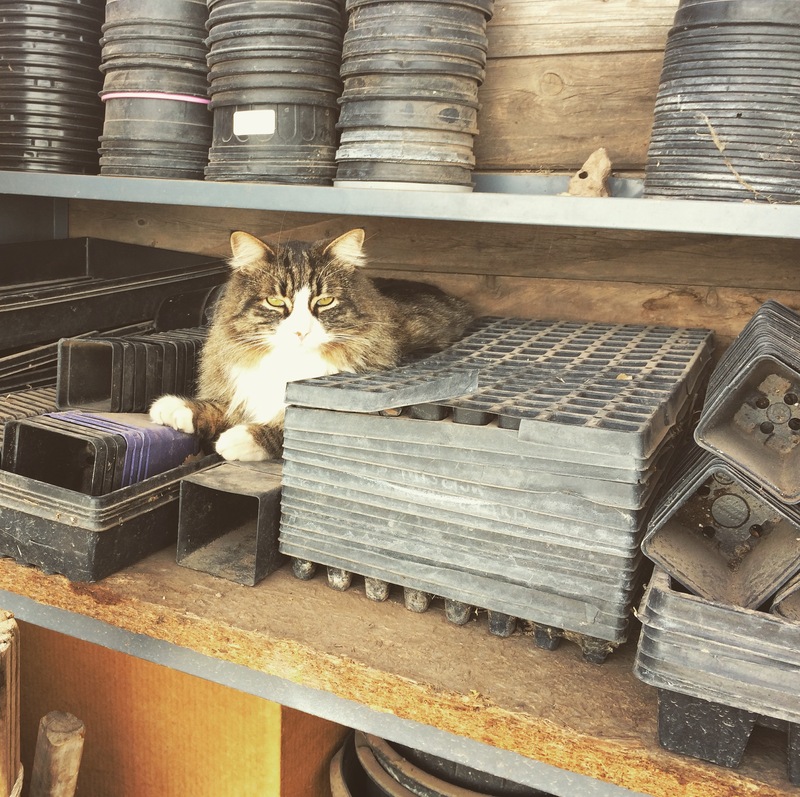 We cleared out enough space at our first few plant sales to make room for a new wave of big trays and I hope the poor ones that spent so long in such tight quarters will forgive us and grow big and healthy. Meanwhile, the ginger has begun sprouting and a few have moved into pots from their flats while we try to figure out the best way to build a raised bed for them. As the lavender comes out, the ginger will take its place and fill up a large space in the greenhouse. The eggplants seem to be holding up well after tackling the aphids. No new mold has appeared and they continue to look strong and are growing consistently. They do, however, have a few holes now thanks to a couple tiny rogue grasshoppers. It appears that the trouble with the tomatillos may have been entirely self-inflicted by yours-truly. 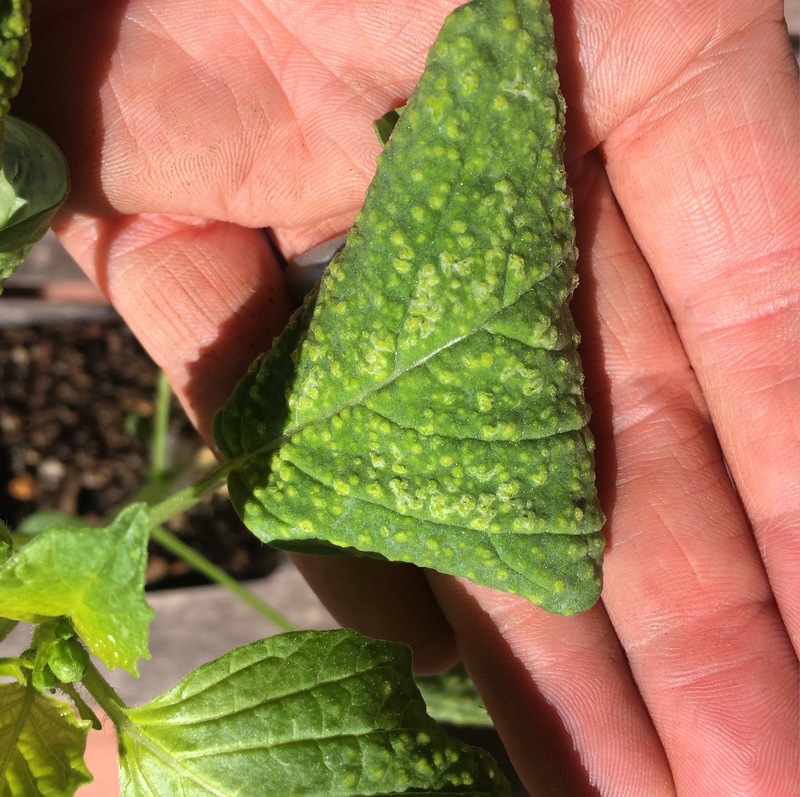 Another search of the almighty internet revealed photos of plants with symptoms that look identical to what ours were experiencing and the problem was simply oedema–overwatering. With the troubled leaves removed, the new growth seems to be looking much healthier. 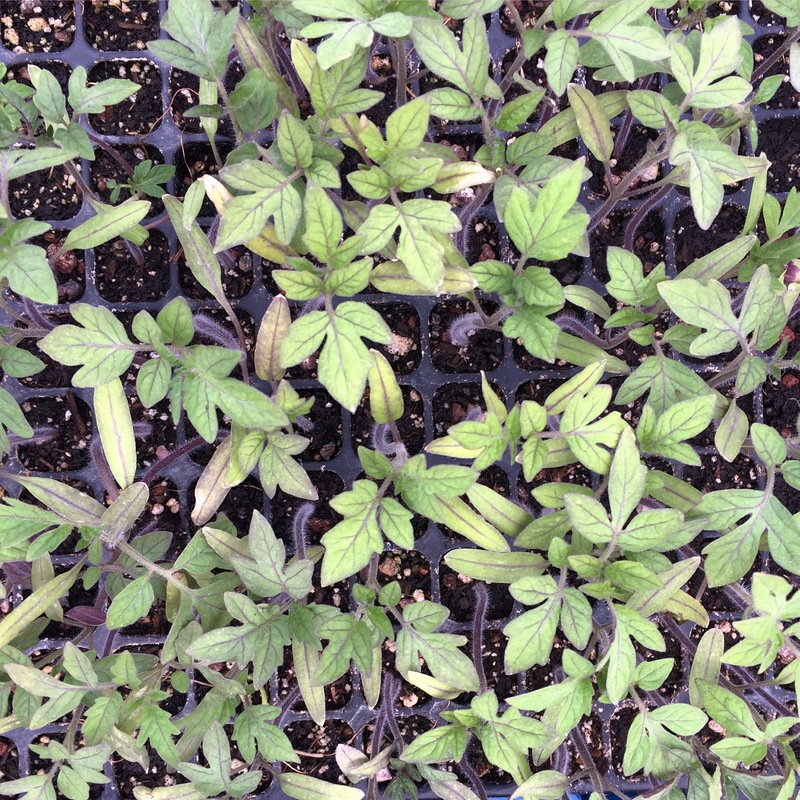 The tomatoes seem to be suffering from another issue, they are showing lots of yellowing and purple veins. Research led me to believe that may be caused by soil temperatures too low for the plants to metabolize nutrients. 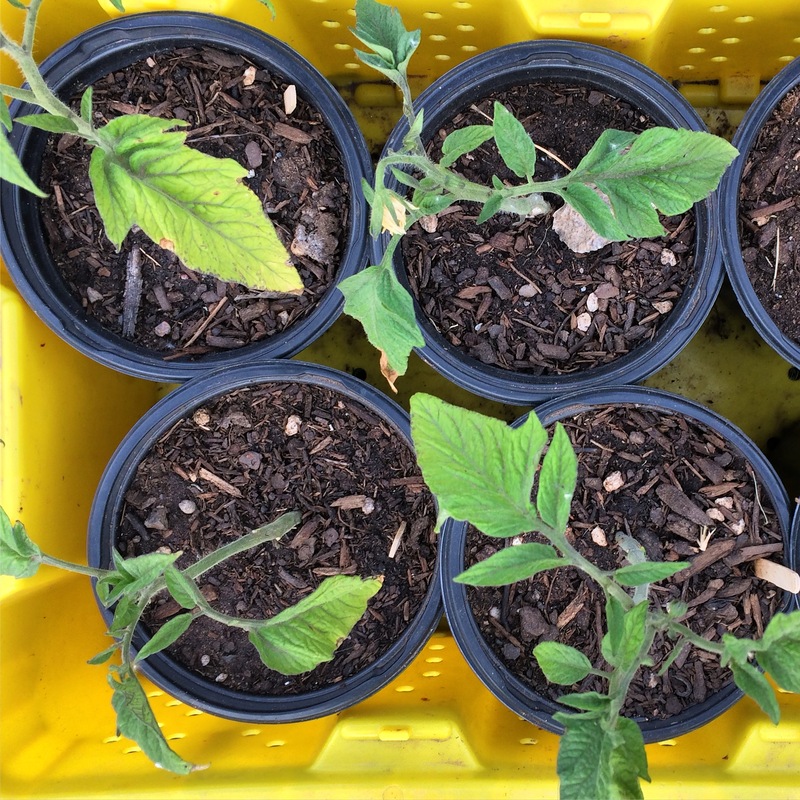 Kemper moved them into larger pots with added compost and gave them a round of fish emulsion to see if we can keep them a little warmer and supplement their nutrient needs. 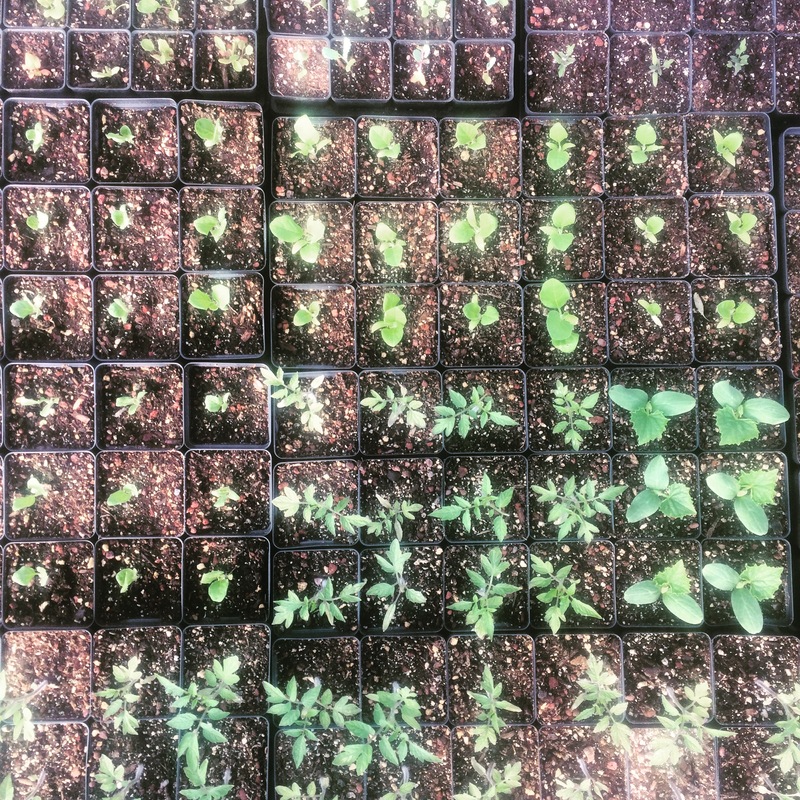 As soon as it’s warm enough for them to go in the ground, we hope they’ll be happy and healthy. 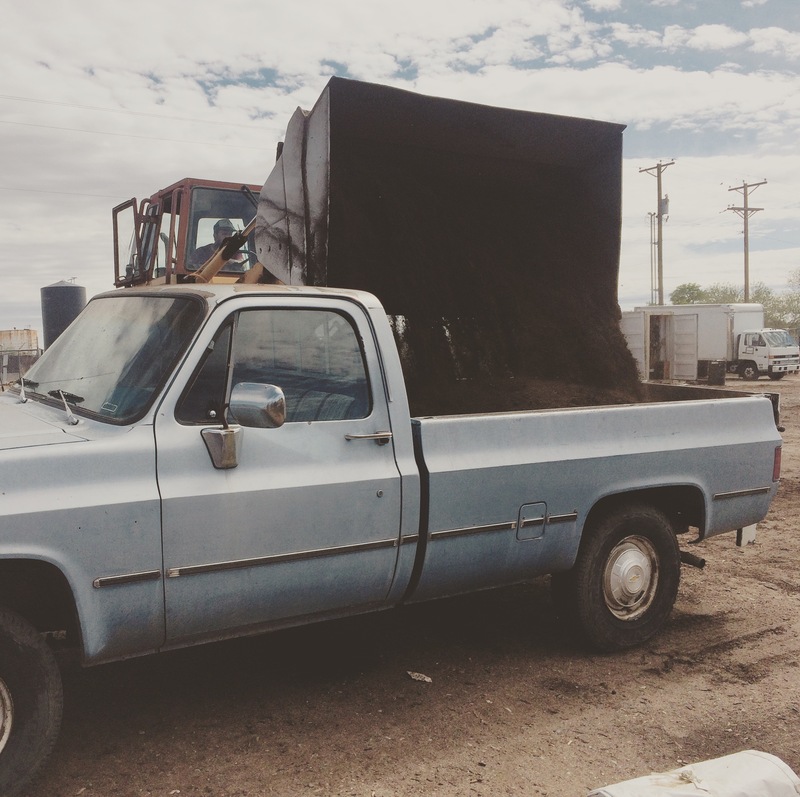 This week we picked up a load of compost from my brother at Soilutions and got our first bed—Chughole Meadows East—in the high tunnel double-dug, composted, and planted. Yay! We shuffled the original plan a little bit to get the most desperate plants in the ground first: beets, broccoli, and cauliflower. When I started beets to transplant, I expected to have beds ready to plant into by late March. Now that it’s nearly May… Start where you are. Use what you have. Do what you can. It’s a ton of work to prep a bed that way with our solid hunks of clay, but the plants in Shady Acres that got the double-digging treatment are looking nice and healthy! So I continue to believe it will be worth it. We’re also planning to implement better soil conservation practices through the winter. 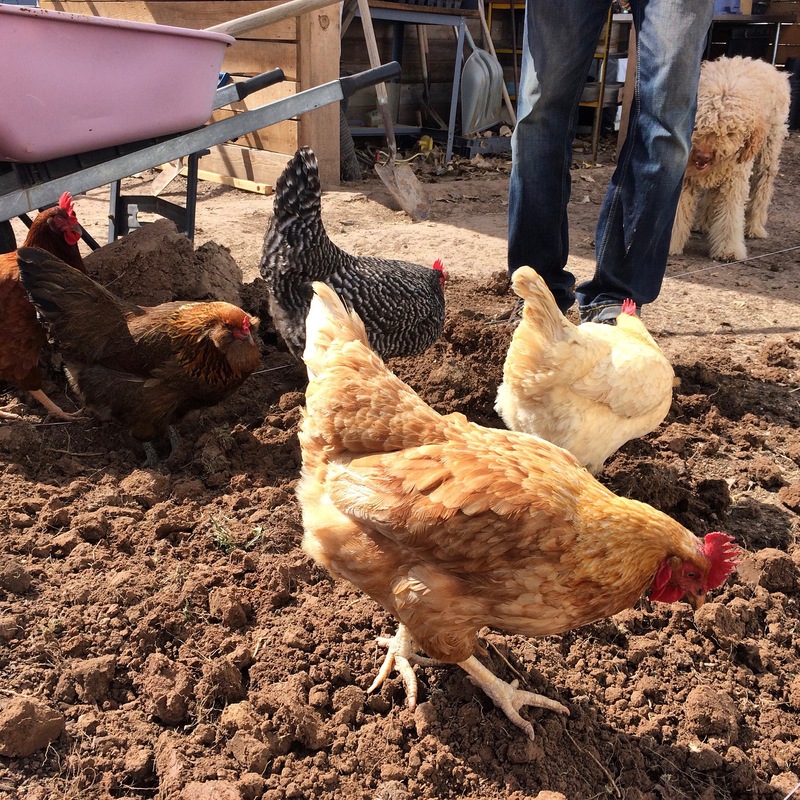 For any beds that won’t be growing fall and winter crops, we will either cover crop or apply alpaca manure and a heavy layer of mulch and allow it to compost in place through the winter. Completely abandoning the garden for six months as we’ve done the past two years certainly couldn’t have helped. 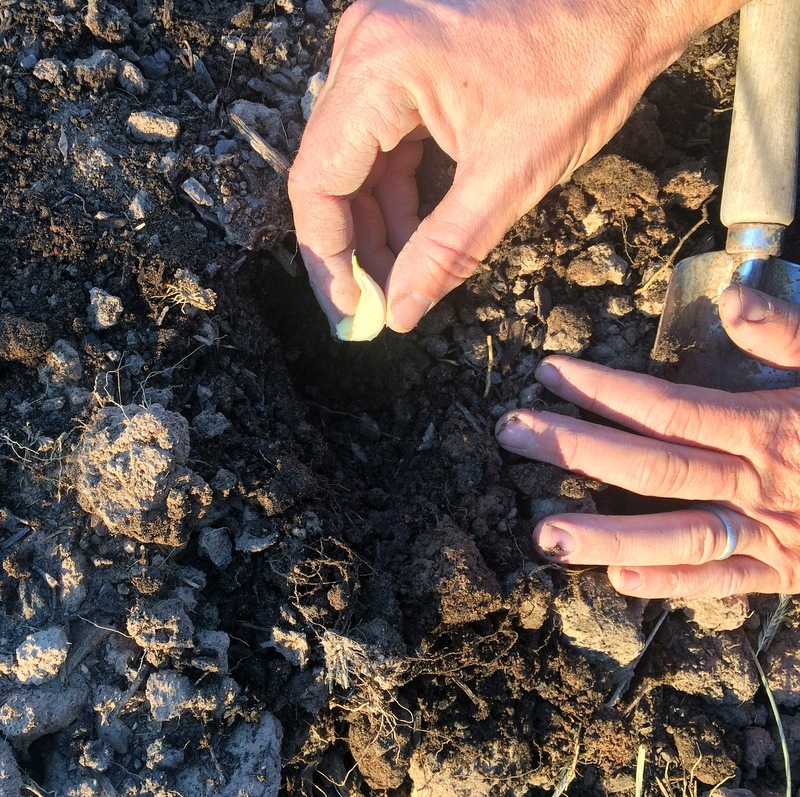 The onions, scallions, leeks, and chives (the last starts still stuck in tiny plug trays) are headed for the ground just as soon as we finish digging and prepping Orchard Estates East. We got partway through this morning before the rain came in and forced a tea and farm journal break. The high tunnel arrived Monday and we’ve got the frame almost completed. The rafters and purlins went up quickly. It’s much easier the second time around. Especially with the scaffolding and chop saw we borrowed from my pop. It’s so so so helpful to have access to tools when we need them. We looked at a few possible configurations for our end-walls and finally settled on putting in a person-size door hung from two vertical 4x4s and a vent up high. With the frame up, we can start marking and digging the beds and get some plants out of the greenhouse and finally into the ground this week! We discovered mice were getting into seeds in the greenhouse again, so we set a fresh run of traps and gave a plea to all the mice to please find food elsewhere. The next morning there were three mice caught. And another one two days later. It feels so strange to be in charge of deciding that the plants live and the mice die. I do not think I’m qualified for that position. The peach tree is full of tiny little fruit babies, and the lows according to the weather station got down to 25 this week. So far they’re still hanging on, miraculously! I hope they can make it a few more weeks! And Shady Acres officially became Swampy Acres with a half inch of rain. 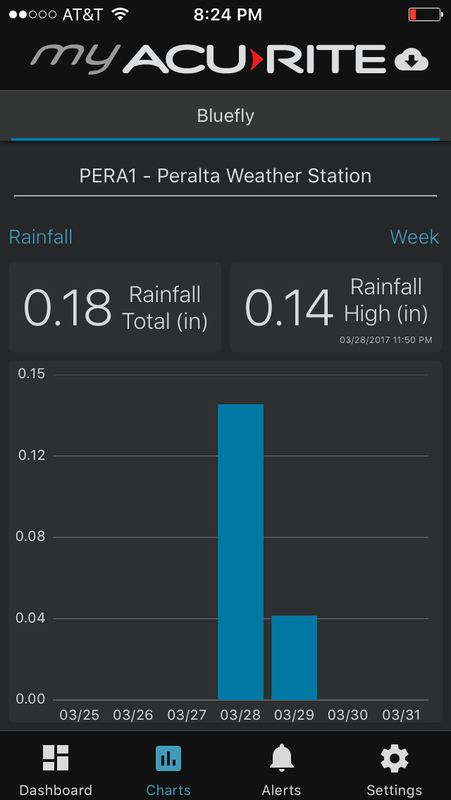 We looked it up—that’s the total average rainfall for the whole month. And then just to make it official, the hose we mended last week keeps busting apart and flooding Swampy Acres just to be sure we didn’t think it was about to dry out anytime soon. With the setbacks from aphids, mice, and construction, we’ve fallen a bit behind on the planting and harvest schedules I initially set out for the season. We have plenty of eggs, green onions, and green garlic to start off our first week, but I was hoping for much more! Hopefully it won’t be too long before the radishes and greens are ready to join the ranks. Running things manually in the greenhouse has been working out so far, but is severely limiting our ability to go places. Our system currently requires us to be around to open up covers and turn off heaters in the morning, turn on fans when the temperatures start to rise, roll up the side vent or turn on the wet-wall, monitor the water level for the wet-wall, and monitor the plants periodically throughout the day and rotate them though the water as needed. 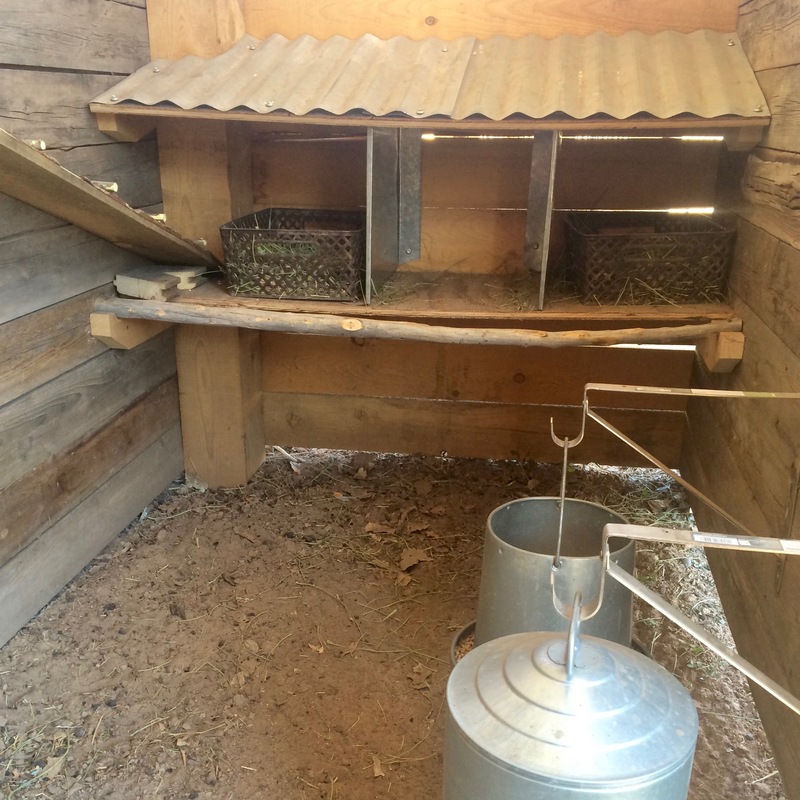 Then we turn the cooling systems off and start closing things up as the sun goes behind the trees in the afternoon, and finally close up the covers, turn on heaters, and set mousetraps each evening at sundown. This is all fine except that the way we turn each of these things on and off requires dragging extension cords around and trying to dangle them across things so they can reach all the plugs they need to without leaving a connection somewhere it will get sprayed by the dripping wet-wall. And until today, we had only one hose running to the greenhouse and garden which meant turning valves on and off and disconnecting hoses and sprayers anytime you wanted to water anything. This afternoon we were joined by my incredibly knowledgeable and patient dad who helped us cut, mend, and rearrange hoses so that we can have water in all the places just by switching valves on and off! It’s amazing!!! So far many of the plants are getting to look really nice, so it has all seemed unquestionably worth it. 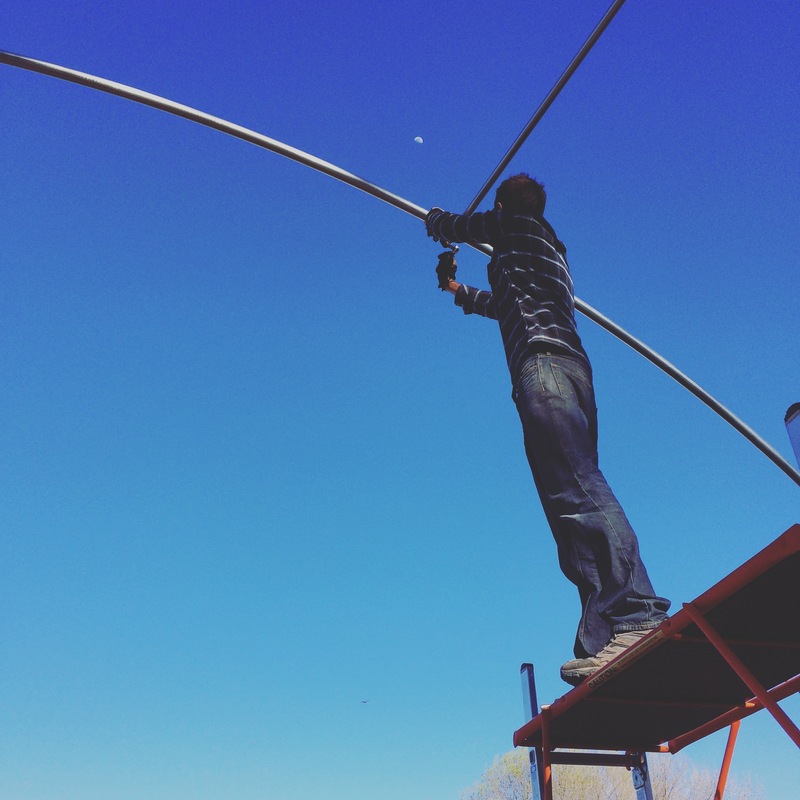 AND THEN … within this week we’ve started encountering problems left and right. 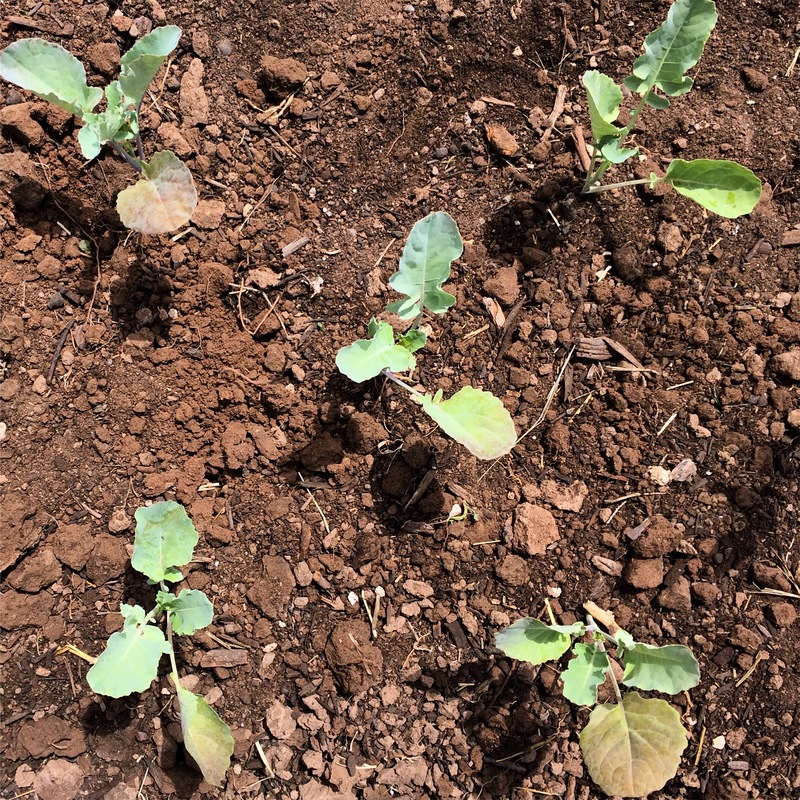 We found sun-scorching on several trays of brassicas (though new leaves appear to be doing better now that they’ve been moved to a shadier location.) Then there’s the mysterious problem with the tomatillos (the leaves are getting bumpy, blistery spots and the plants are dying.) My frantic obsessive research is leading me to the hypothesis that the damage is caused by thrips? But they’re SO small I’m having a very difficult time confirming this idea. 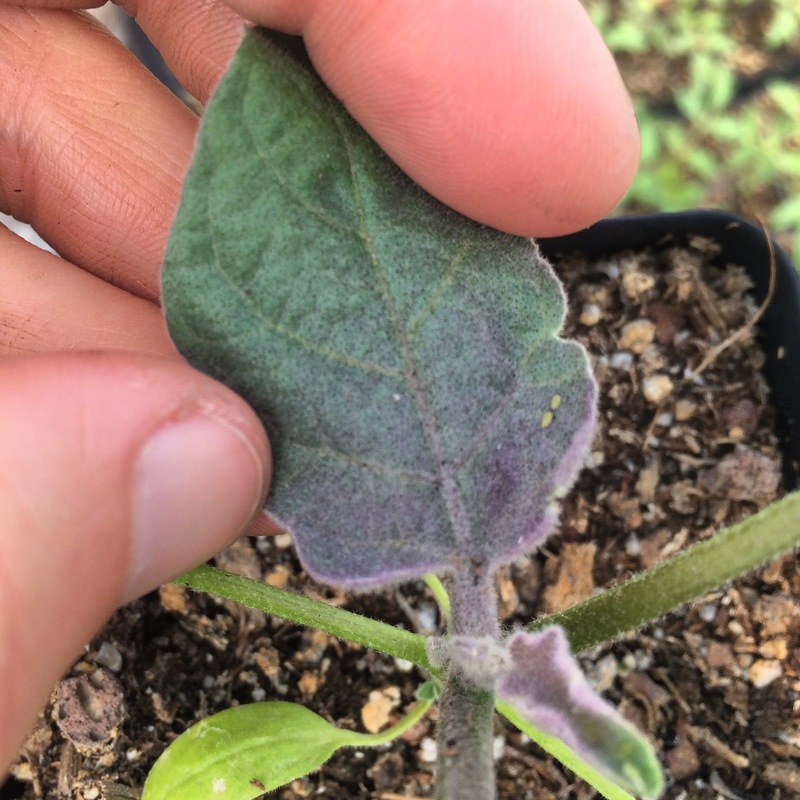 A strange grey-ish mold is appearing on the eggplants. Aphids have appeared on the eggplants and several of the brassicas. UPDATE: My dad brought us a magnifying glass, which allowed me to (I think) confirm the presence of thrips, which we have attempted to treat with a Neem spray. I also discovered that everywhere I witnessed mold on the eggplants, I also saw aphids. A little googling led me to believe we were getting ‘sooty mold’ which grows on the sweet excrement the aphids leave behind. 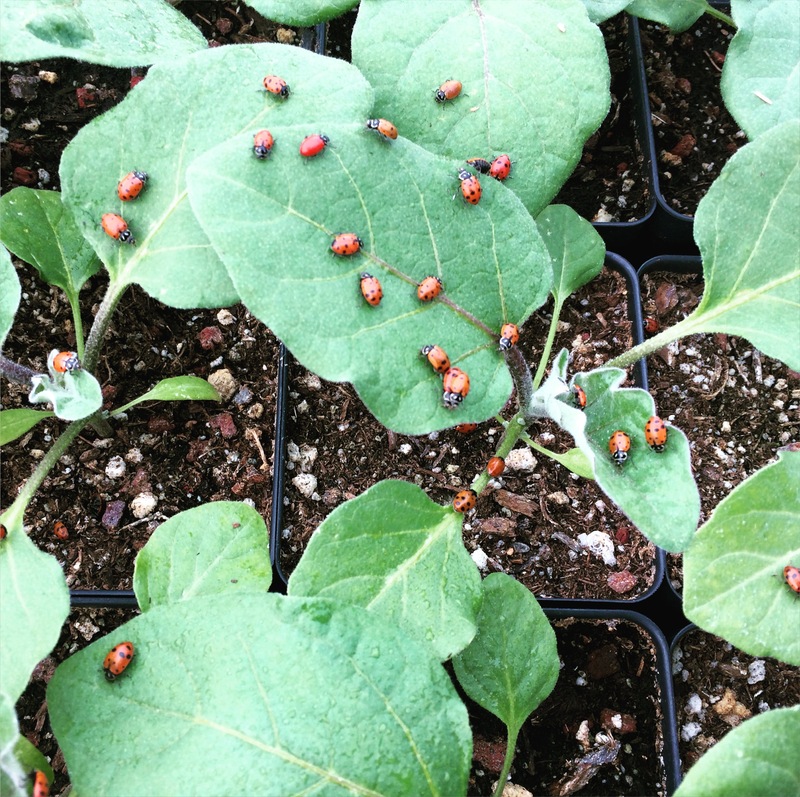 So we are trying ladybugs to control the aphid population and hopefully also curb the mold. 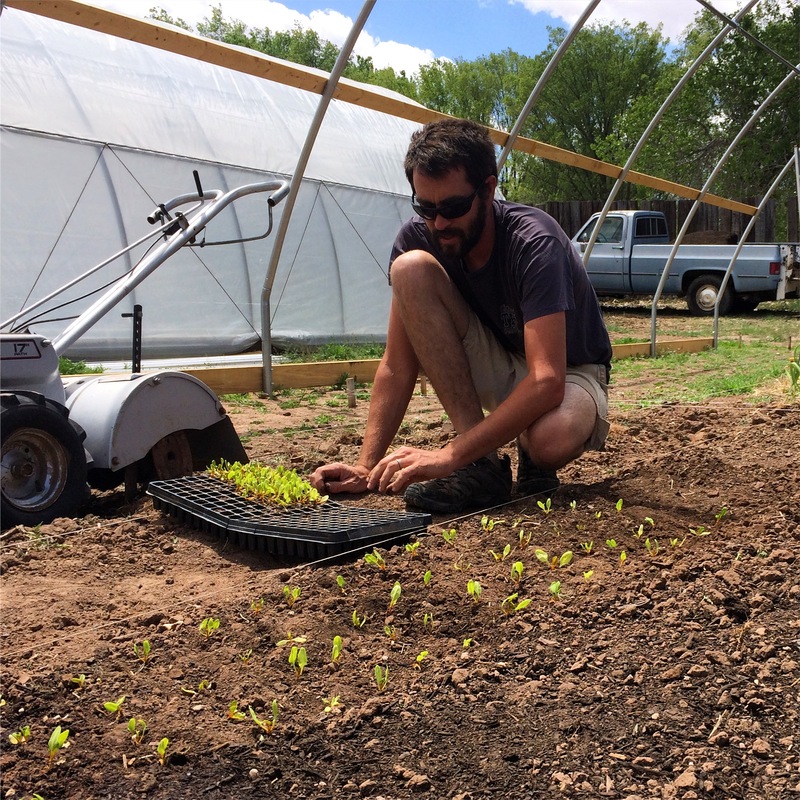 High Fives for High Tunnels! 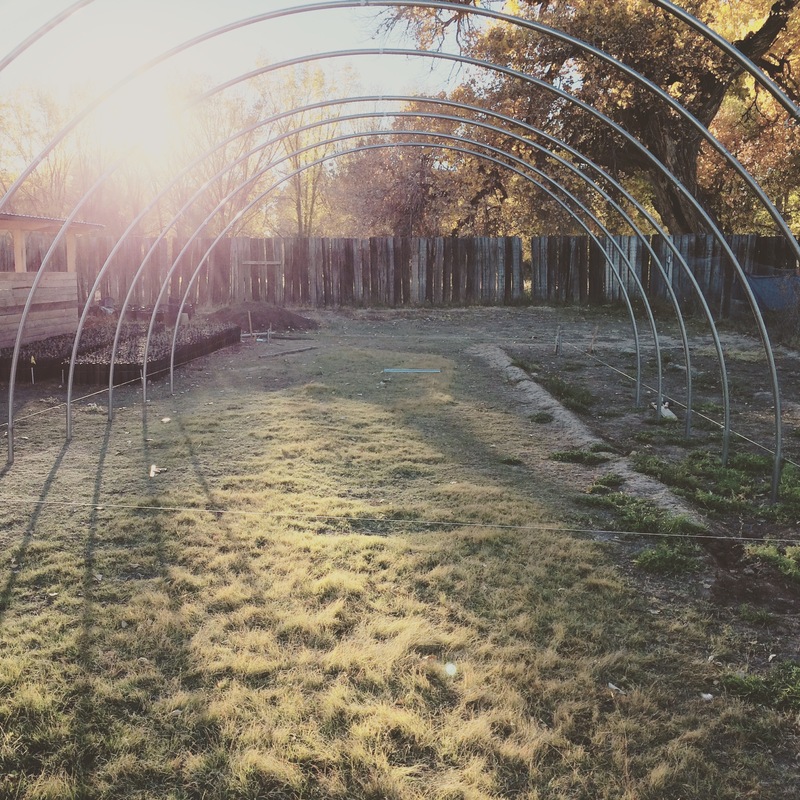 Our high tunnel is ordered and on it’s way! It’s scheduled to be delivered Monday! Meanwhile the only bed we have ready to plant is still Shady Acres. 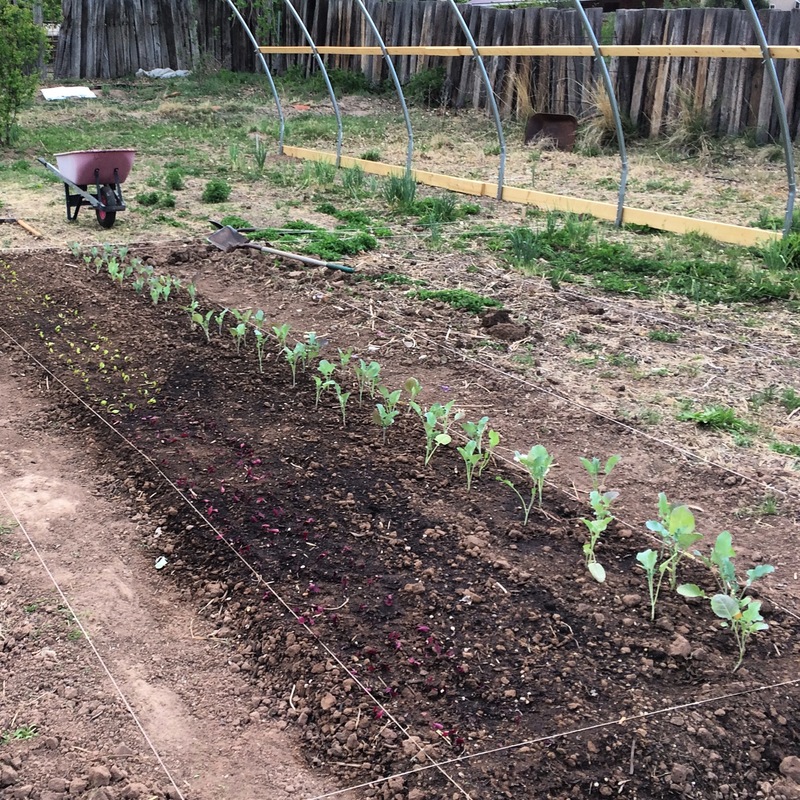 We got radishes and carrots seeded, and kale, lettuce, arugula, and collard greens planted out this week. Thank goddess we have Callan to call on. She’s going to come over this week and help me prep beds so we can prove that two hot ladies with shovels and broadforks can do the job in less time and money than one rented tractor! 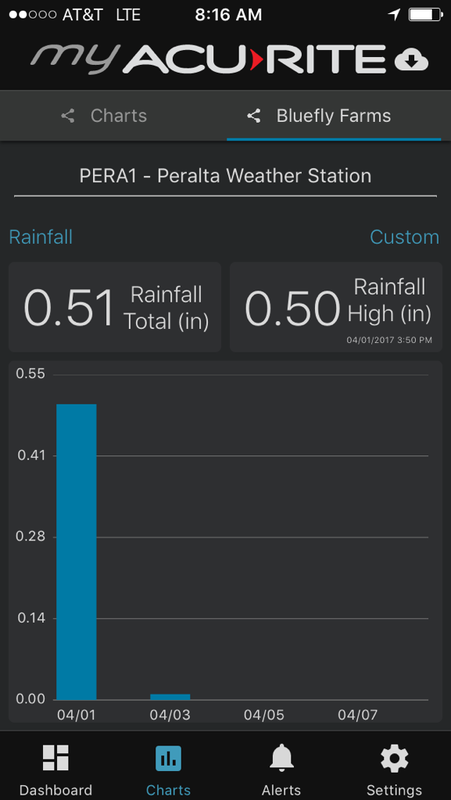 We recorded our first rain on the weather station this week—0.18 inches over two days. Thankfully not enough to turn “Shady Acres” into “Swampy Acres,” but if we don’t install gutters on the loaf I expect that will happen soon. Kemper rented a wood-chipper to chew up lots of branches we’ve had lounging about and get them composting. He cut and sawed and dragged and pulverized Russian Olives and Siberian Elms from all corners of the property along with lots of pieces of the dearly departed Juniper we removed last year. Now we have a glorious pile of wood chips to compost with. To celebrate the vernal equinox we continued a tradition we started two years ago by decorating and then burying eggs around the farm as blessings of fertility. A few eggs went into the post holes that were left open after removing the fence that was where the new hoophouse will be going. We put our special water blessing eggs right down all the way into the water table. Sin agua, no es vida! 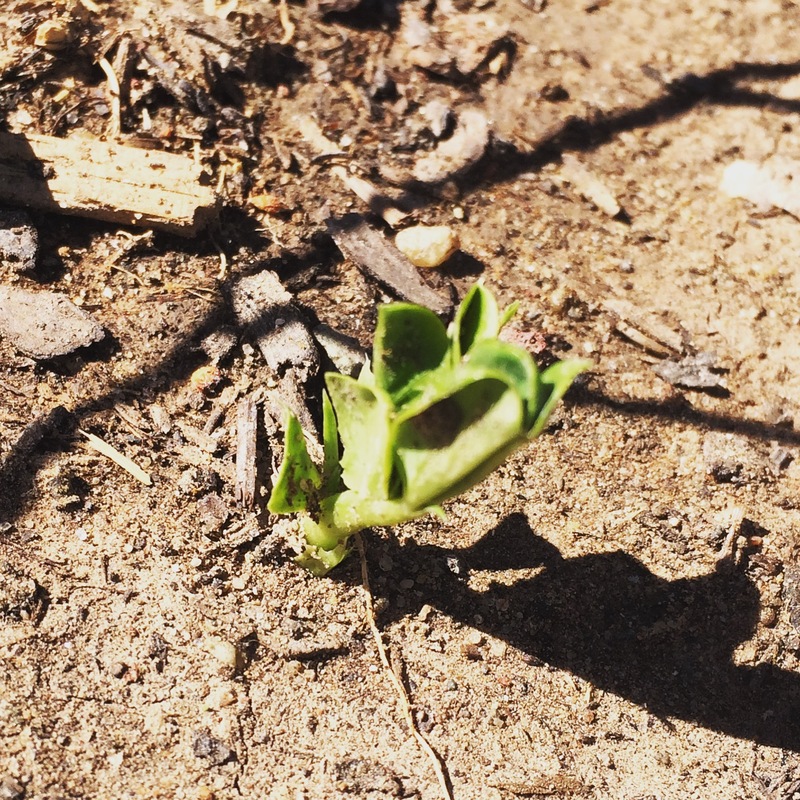 The peas are popping up in Shady Acres and looking happy! 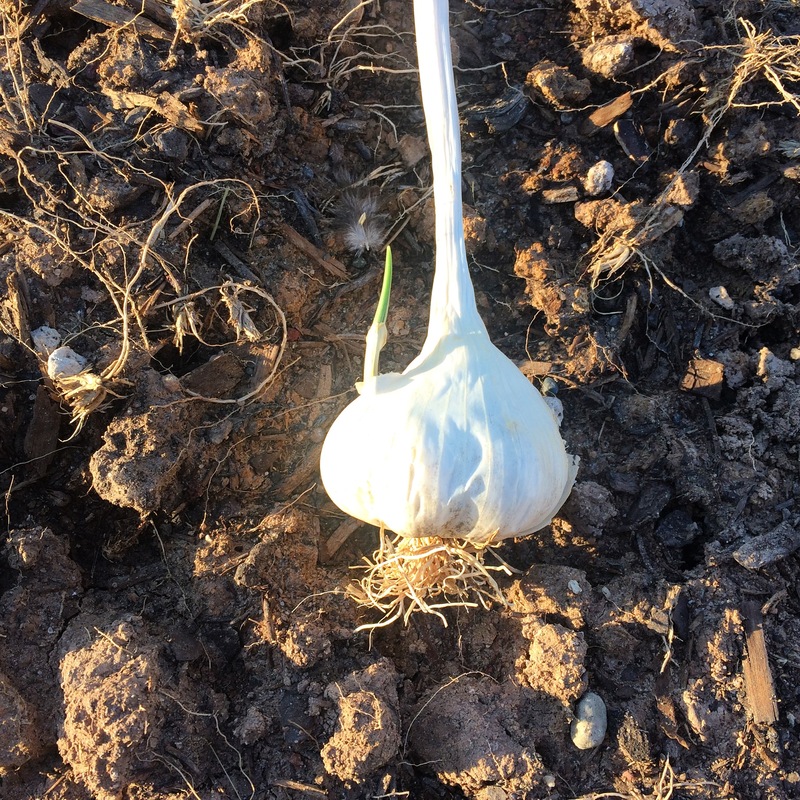 And the garlic alongside them is making up for lost time. It’s all already a couple inches tall. Perhaps the March planting will work out? 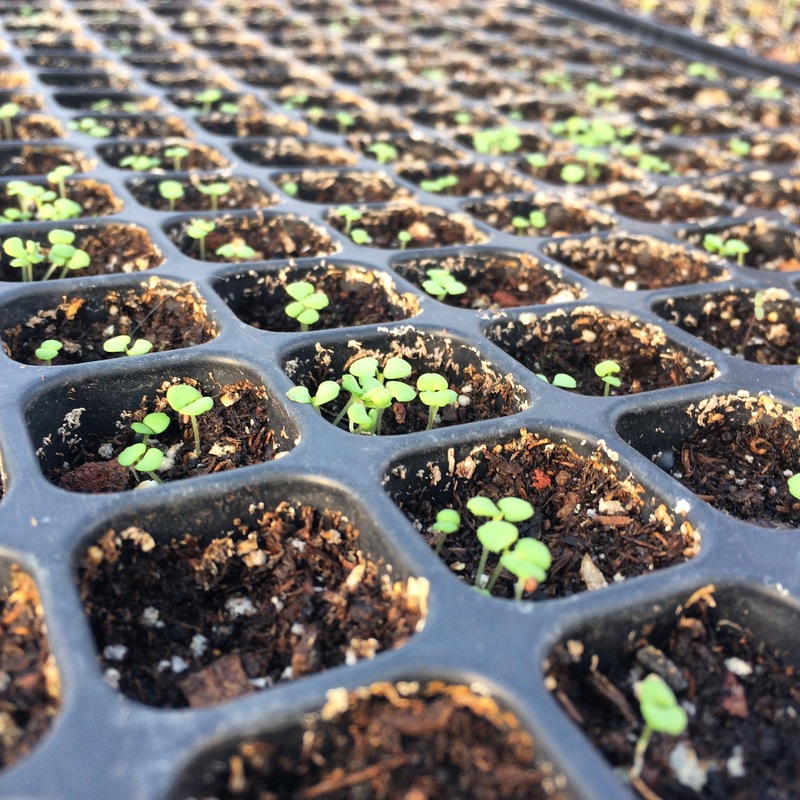 This afternoon I seeded and transplanted twenty one new trays… It’s so satisfying to see the rows fill up just like we planned. Kemper has been working hard to try to get the wet wall running. It’s been getting up into the nineties inside the greenhouse every day and the lavender are starting to send up buds. We’re hoping if we can get the temps down they’ll put their energy into more foliage instead of flowers. 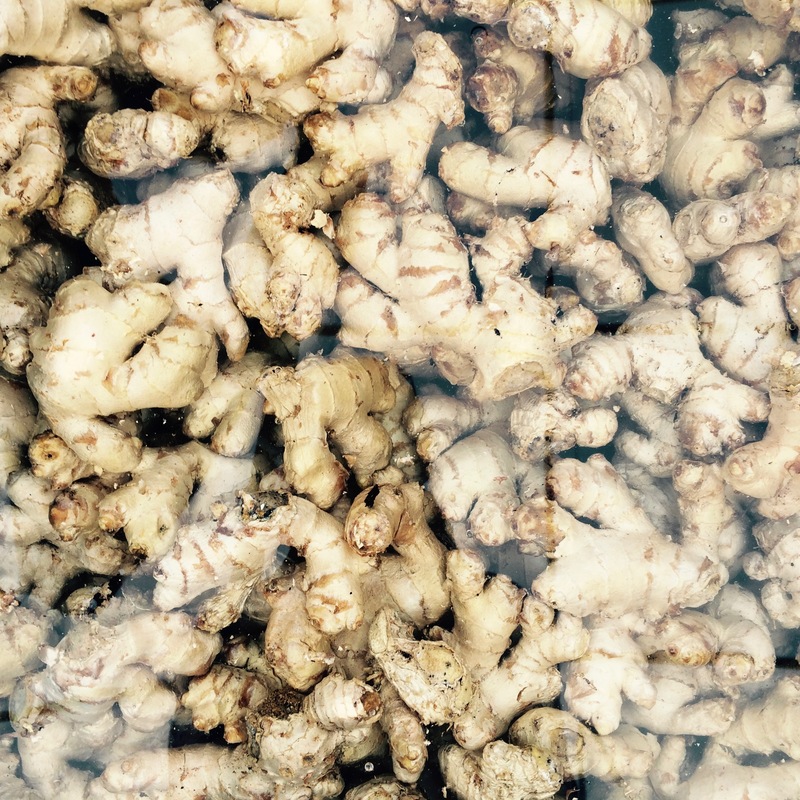 And we added a whole new crop to the greenhouse this week—Kemper ordered a huge batch of organic ginger from Hawaii. The timing might work out just right to have it fill in the spaces that are opened up as the lavender gets planted out. We planted peas and garlic in the beds we double-dug last week (now named Shady Acres.) 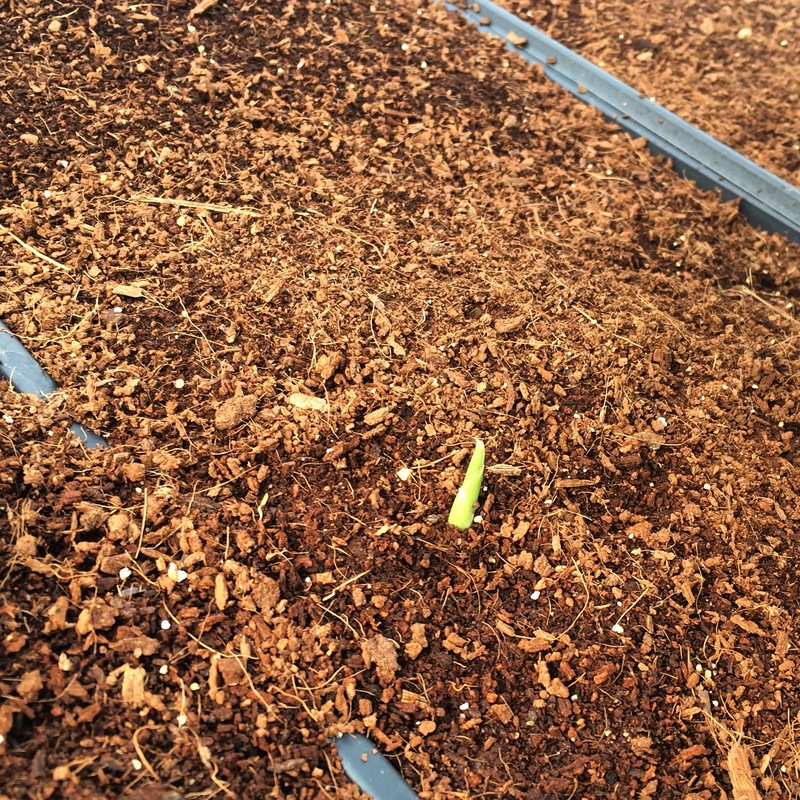 The garlic popped up within a few days but we’re still waiting on any sign of the peas. The baby chicks have started spending the days outside in the old hog cage to keep them safe from all the full size creatures. 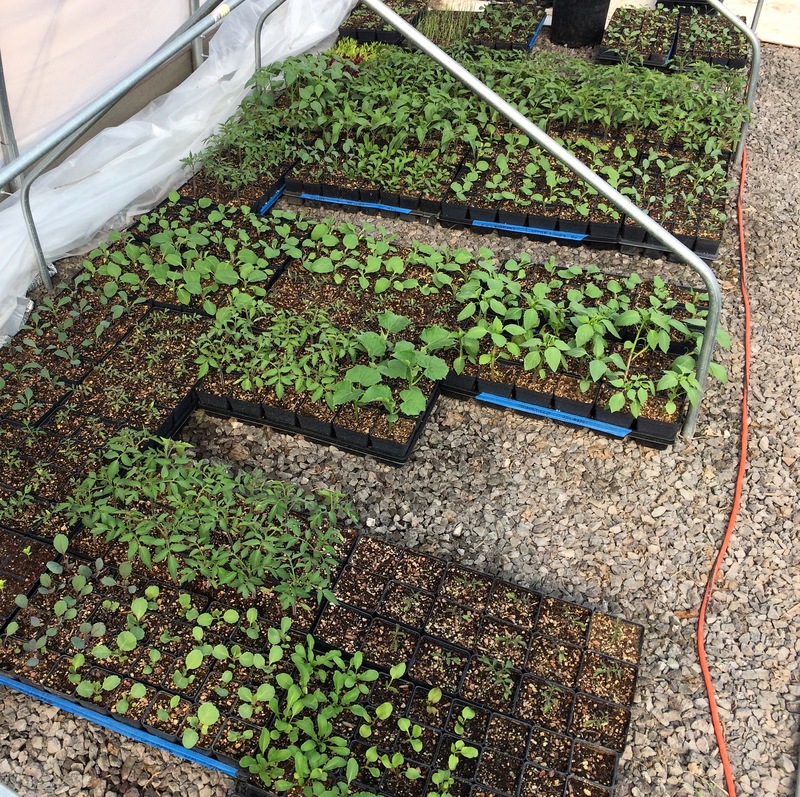 We’re trying to keep up with transplanting seedlings into larger pots as they’re ready… Most of the brassicas and all the tomatoes are now in 2″ and 2″ pots and looking happy. I had to separate lots of little ones that had come up two in a cell, and they all seem to have adjusted just fine. I also re-seeded as many of the mouse-acred plants as I could and the new ones are popping up and happy. 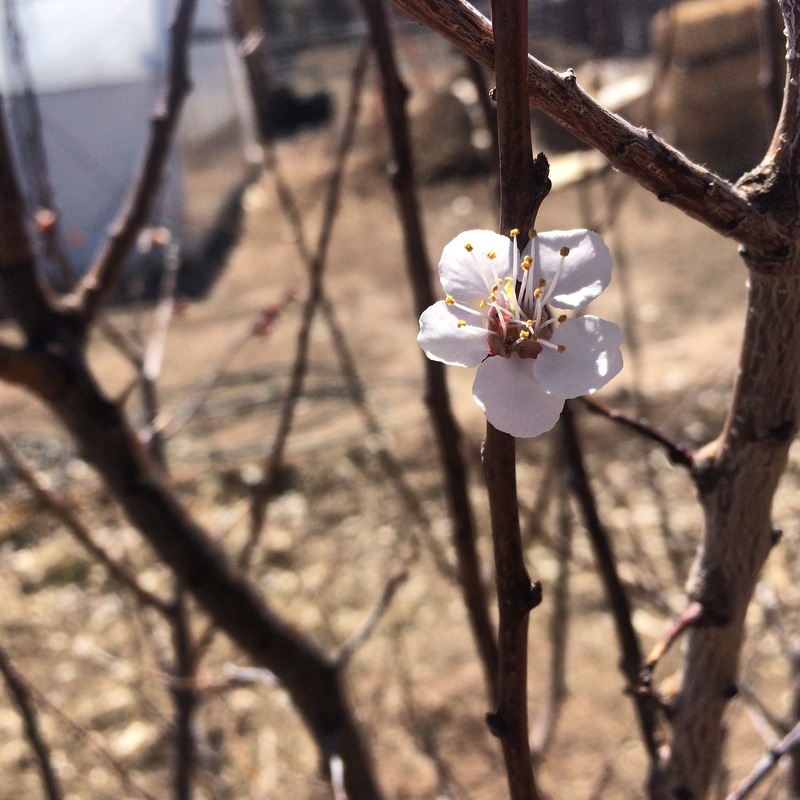 The apricots and peaches are in full bloom. Yerba mansa is waking up. And I spotted a full size grasshopper in the garden. 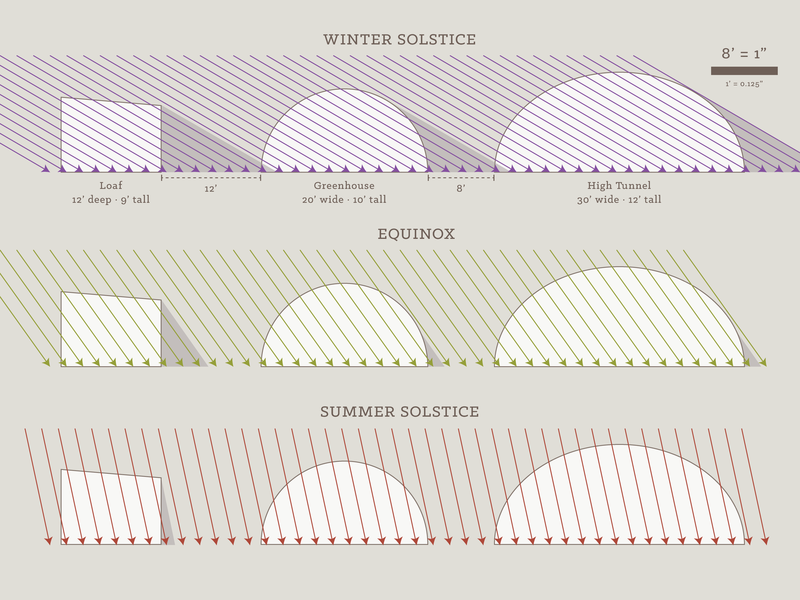 All before the first day of spring. The next few decades are going to be a weird ride. We’re been talking for years about assigning names to parts of our farm that mimic real estate subdivision names and we’ve finally settled on them. We’ll put up adorable cheesy signs eventually. But for now it will be helpful to have a system to refer to each bed in our crop plans and record-keeping for our organic certification. 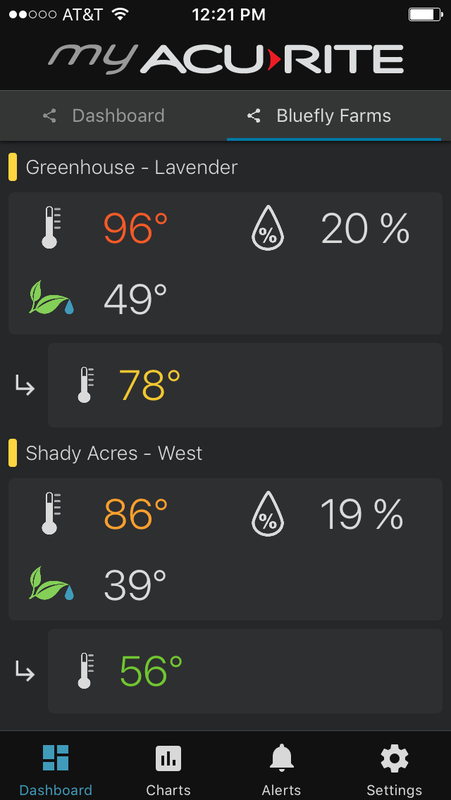 Kemper got us a super sweet weather station so we can monitor temperature, humidity, air pressure, precipitation, wind speed and direction, soil and air temperature inside the greenhouse, and soil temperature in our planting beds outside! 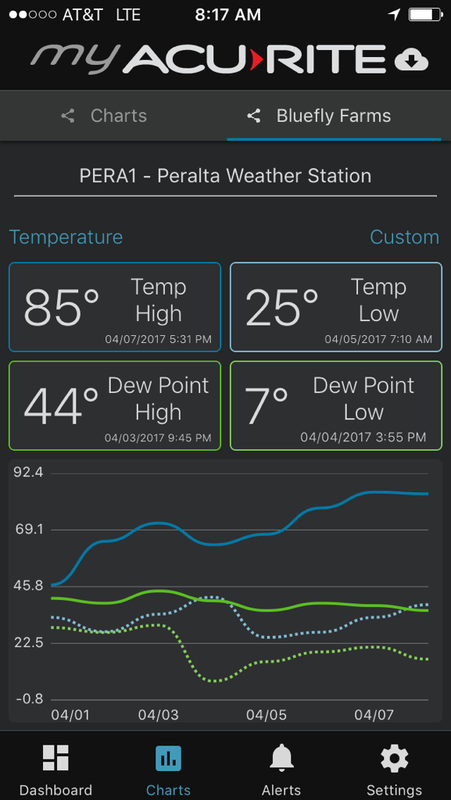 It can alert us when certain high and low temperatures are reached, and we can check it remotely. It’s the coolest. Kemper pretty much doesn’t look at anything else anymore. So so so many forms! 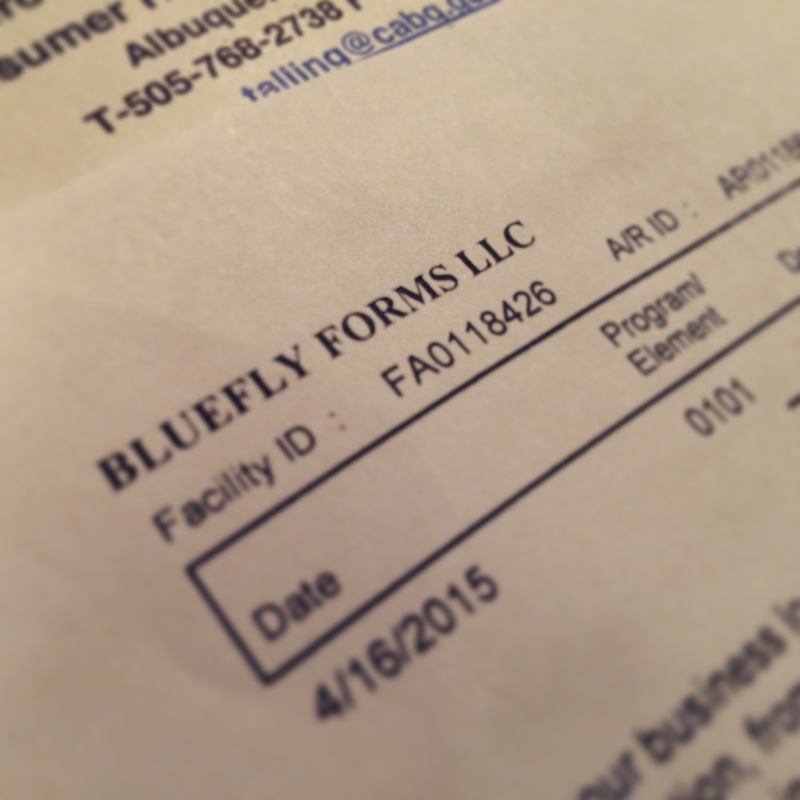 Remember that time the state named us Bluefly Forms? Yeah. This week is all about job sheets, specifications, land history forms, environmental health permits… the list never ends. Our biggest obstacles currently are trying to navigate the opposing requirements of the NRCS and the Organic Program. Planning out our fencing has proven especially tricky. The NRCS requires either treated lumber or cedar. The organic program prohibits treated lumber. Cedar is really really hard to find (and expensive!) We are also allowed to use drill-pipe but the NRCS wants it painted and the organic program prefers that it isn’t. Navigating one set of rules is hard enough! The intersection of the two of them is just exhausting. We have also discovered an amazing phenomenon in which every time we look deeper into what it will take to build out our projects or get closer to ordering them, they get more expensive. Every single time. The list prices actually go up, we remember other parts we need, another requirement comes to light… My original pricing research that showed each project being achievable within the reimbursements are now looking quite different. 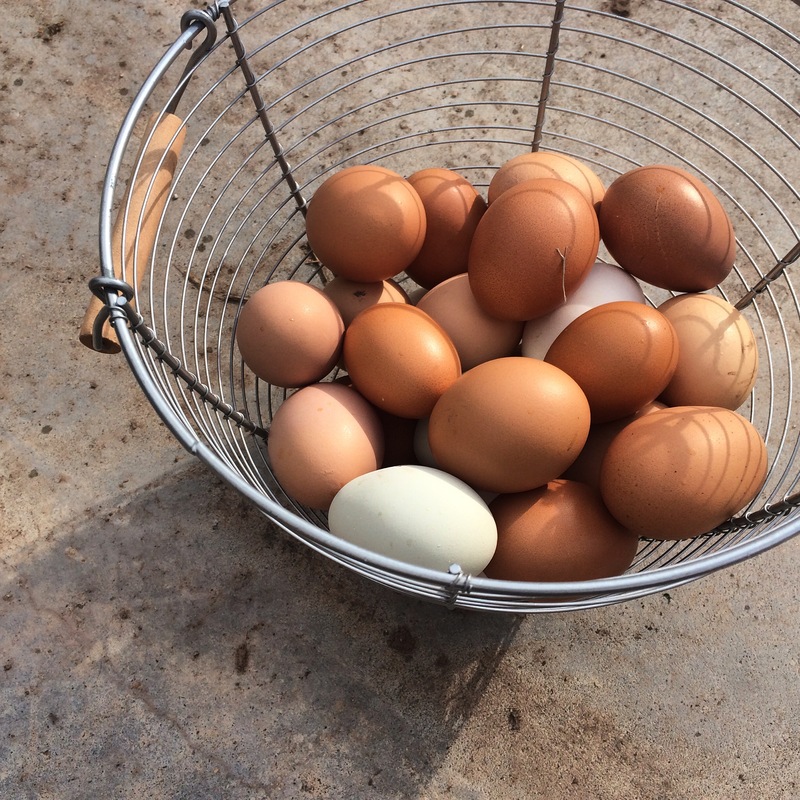 Our egg production has gone way up with the warmer temperatures but I’ve been wanting to add more green to our egg rainbow since last year. 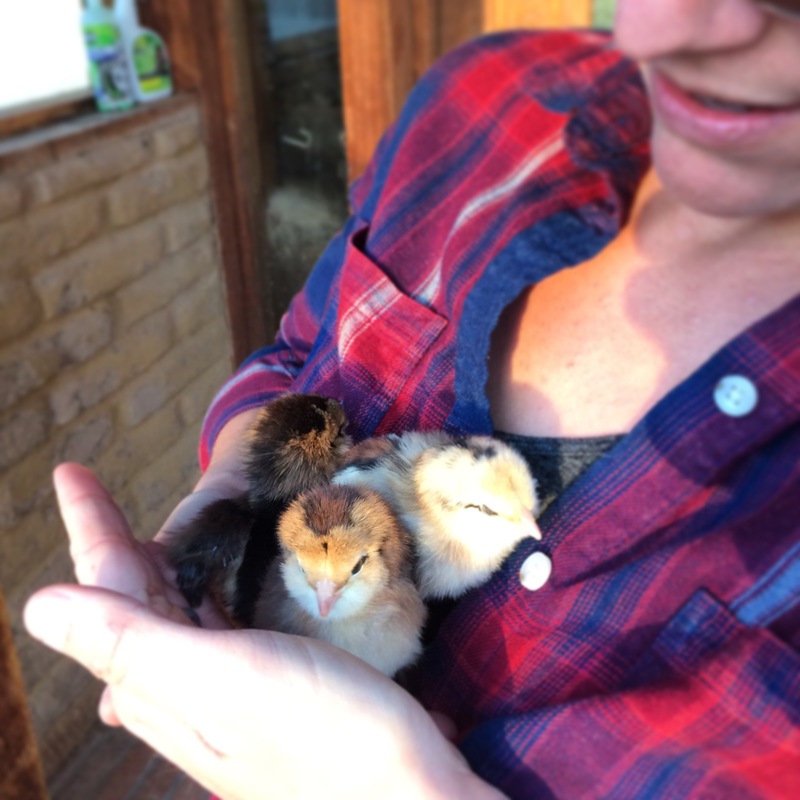 So with the arrival of the first batch of chicks at the feed store I was ready! And I love the way they bring new life and spring and beginnings right into the house in the most joyous and palpable way. 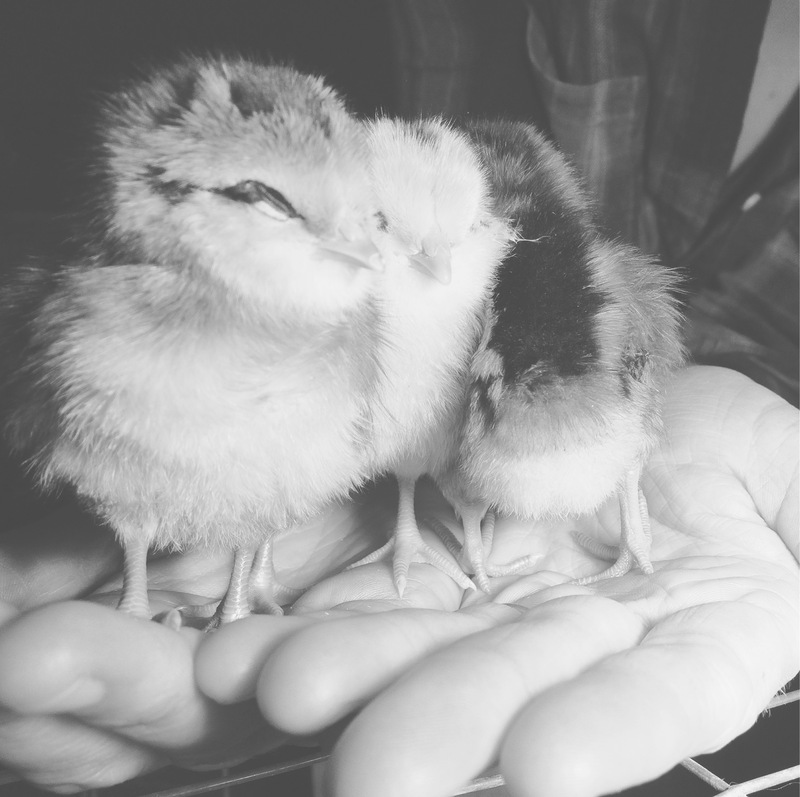 And so we got three new chicks, all Americanas—Dr. Naylor, Francesca, and Turtle. And they’re SOOOO FLUFFY! 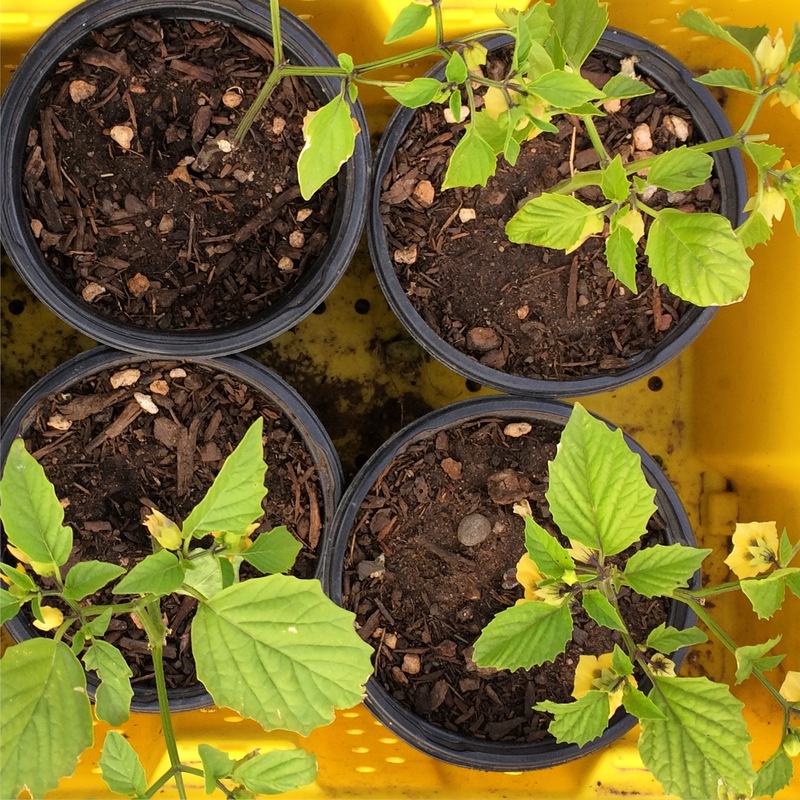 The first batches of transplants went into their big kid pots this week. 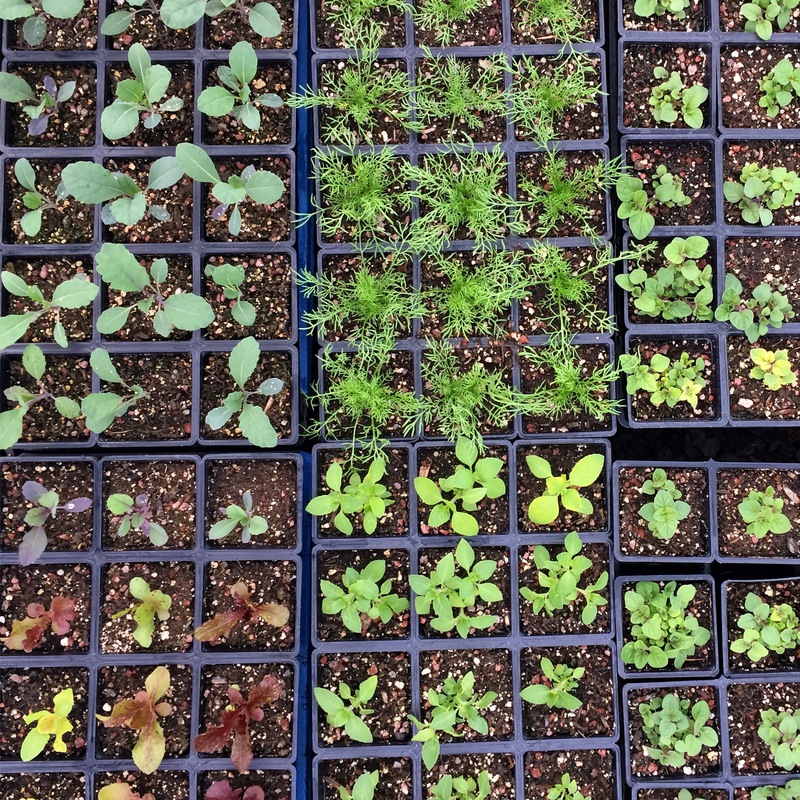 It’s so satisfying to see neat little rows of happy teeny plants. It really shouldn’t be so surprising to see how many plants come out of a 200-plug tray when you spread them out, but it’s quite a lot! After some time to recover from the mouse devastation (and one culprit caught) I have begun re-seeding the trays that were wiped out. Peppers seemed to be a clear favorite of those hungry vermin, and the spinach and cilantro suffered, too, along with marigolds and zinnias, but those may have simply been collateral damage being next to peppers. 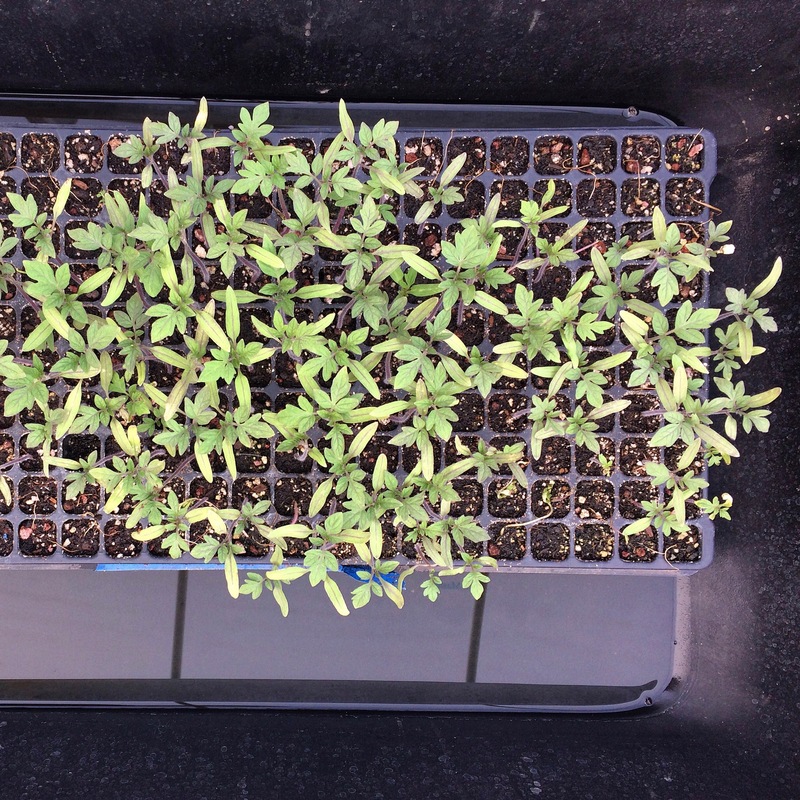 I reseeded as many as I could with what seed I have left, and set a tight perimeter of traps around the fresh trays. We started to prep our first planting bed for peas radishes and carrots (and really really late garlic because… Do what you can!) The area this bed is going into is directly north of the Alpaca Loaf/Chicken Coop, so it’s been getting a huge amount of water from the still-un-guttered roof and now also from the greenhouse, and it was heavy clay to begin with. I could hardly get through the surface with the broadfork. So we decided to give double digging a try and add lots of compost. It took both of us half the day to finish the first 4′ by 22′ bed, but it does look rather more inviting for baby veggies now. Time will tell if we find this amount of labor pays off! After all that hard digging we took the shovels over to the garden to compare how our mulching and manure and compost and clover have done, and the soil there is much healthier! 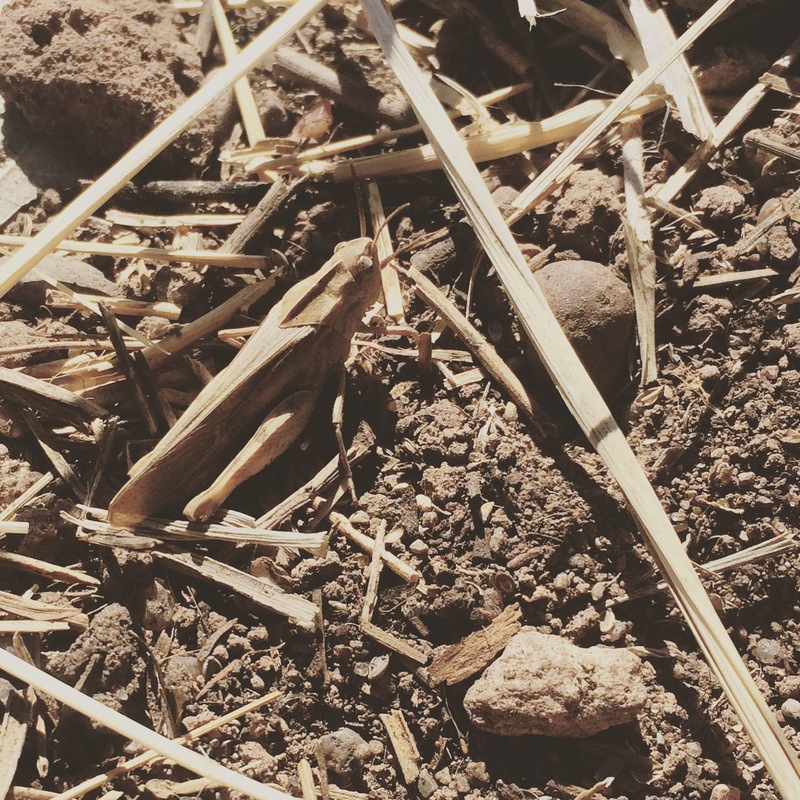 Darker, better aggregate, less compaction… It’s going to be a walk in the park to prep those beds by comparison! 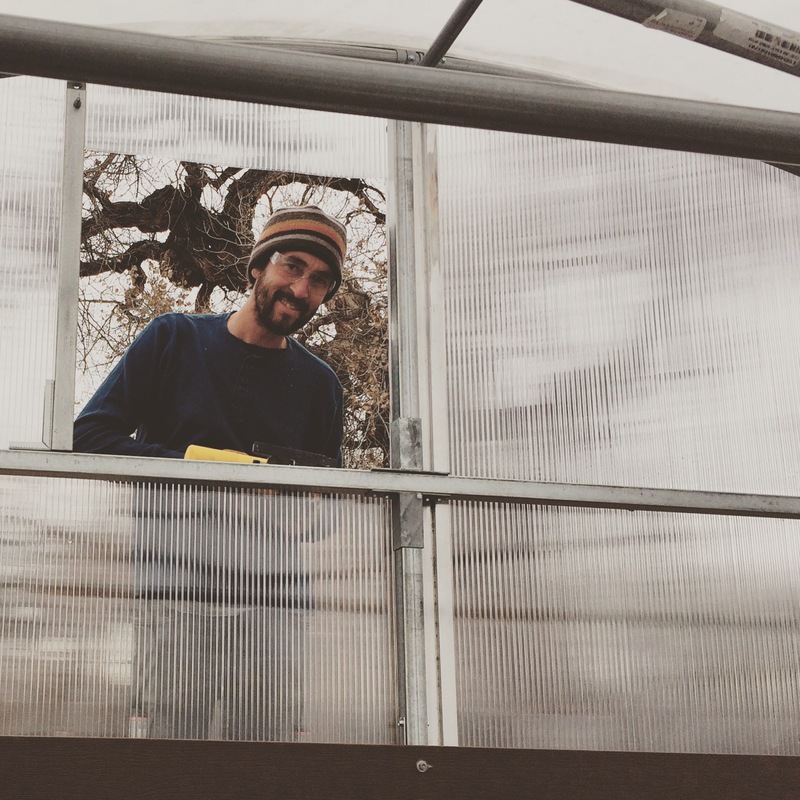 We started building our greenhouse in November… It was all-consuming and fun and empowering and frustrating and it might never ever be all the way done. The best part of it by far is the rad high-hose we installed so we can water everything without dragging a hose down the aisles. It’s THE BEST! We’re still working on getting gas and electricity hooked up, so we’re getting by with extension cords and space heaters for the time being. We’ve got the cold sensitive plants in mini-tunnels that get tucked in at night, and so far that’s keeping everything happy. 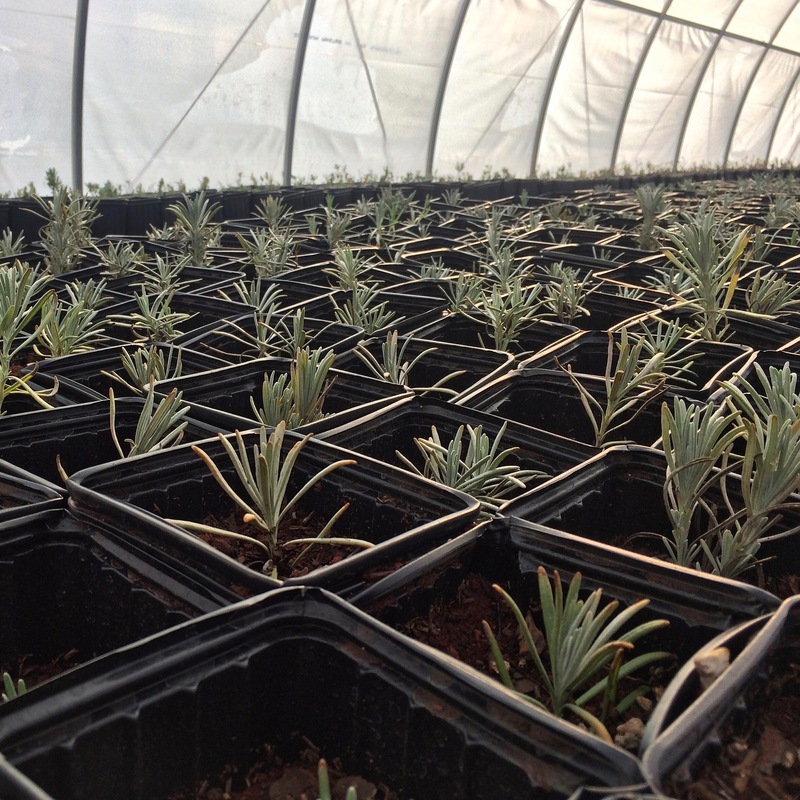 We have a couple thousand lavender transplants slowly waking up from their winter slumbers. They all have strong root systems so we’re just watching to see them explode in growth above the soil. First, I ordered all the seed I could think of and got so excited when they all arrived I just started putting them in trays… 100 or 200 of everything. And then I started realizing I was about to run out of real estate for seed trays and was going to overrun the garden with all those plants. Then, we went off to Colorado for a weekend and left our brave and wonderful farm sitters to deal with our shabby high-maintenance system. Most of the trays of starts didn’t make it through the hot afternoons. But the time away gave me the chance to finish our garden plan and come back with more realistic numbers for each variety we’re growing, including some to sell at plant sales, and enough to support our very informal trial run CSA that we’re putting together for this year. 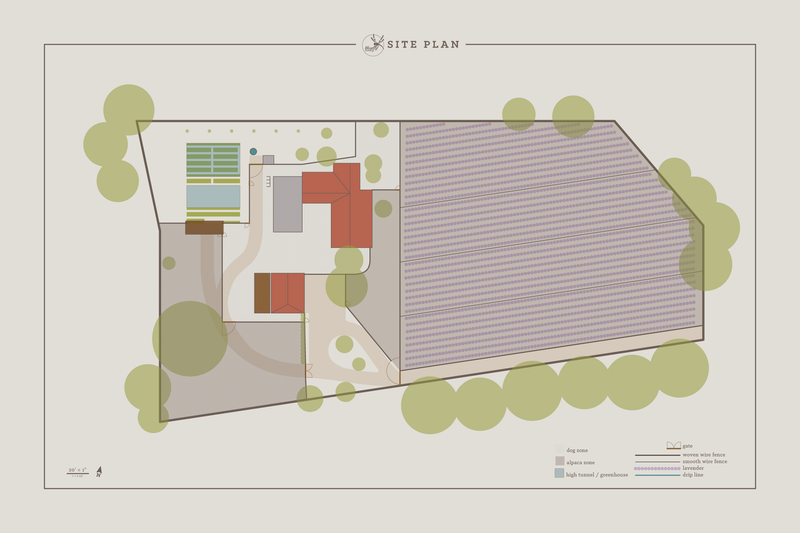 This overall farm plan has proven indispensable again and again. 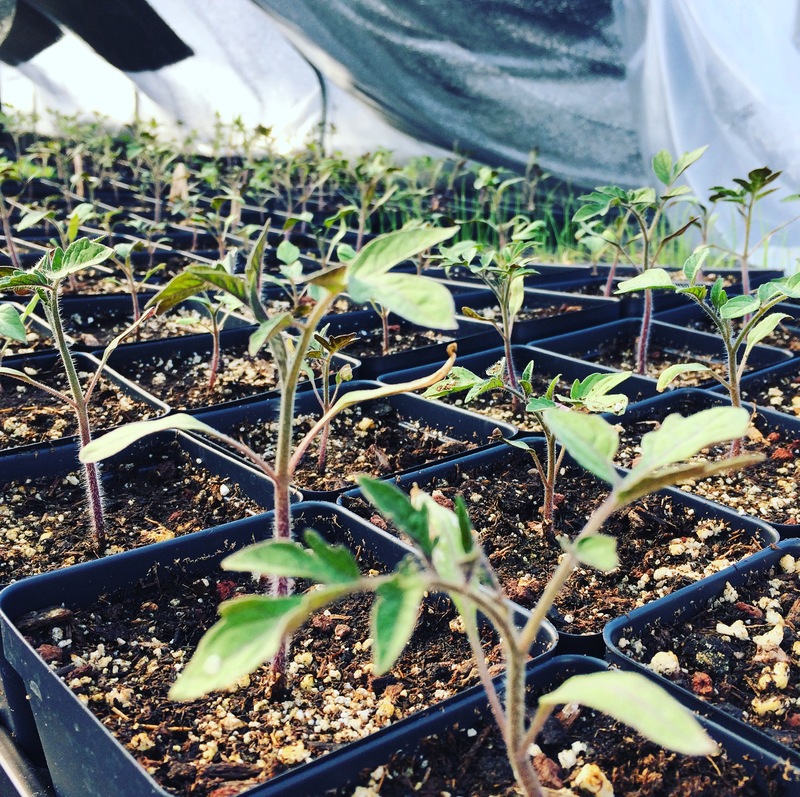 We’ve used it for the conservation practices we’re implementing through grants from the NRCS, for our Organic Certification, for our planting numbers, and sometimes just to look at and daydream. The solstice drawings helped us figure out the best placement for our greenhouse and high tunnel to maximize their solar gain. 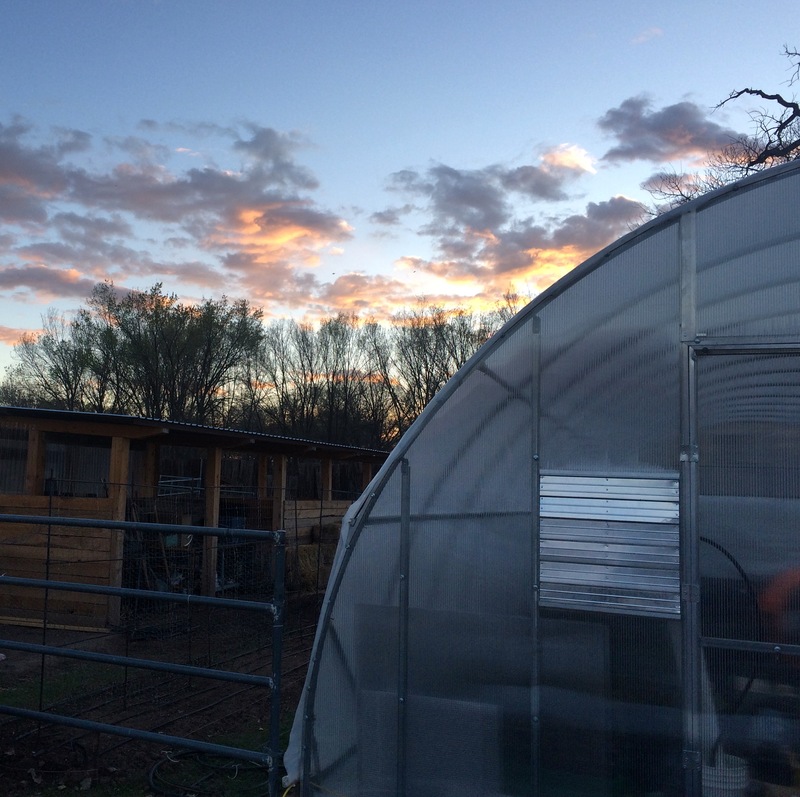 The high tunnel is scheduled to go up by April. 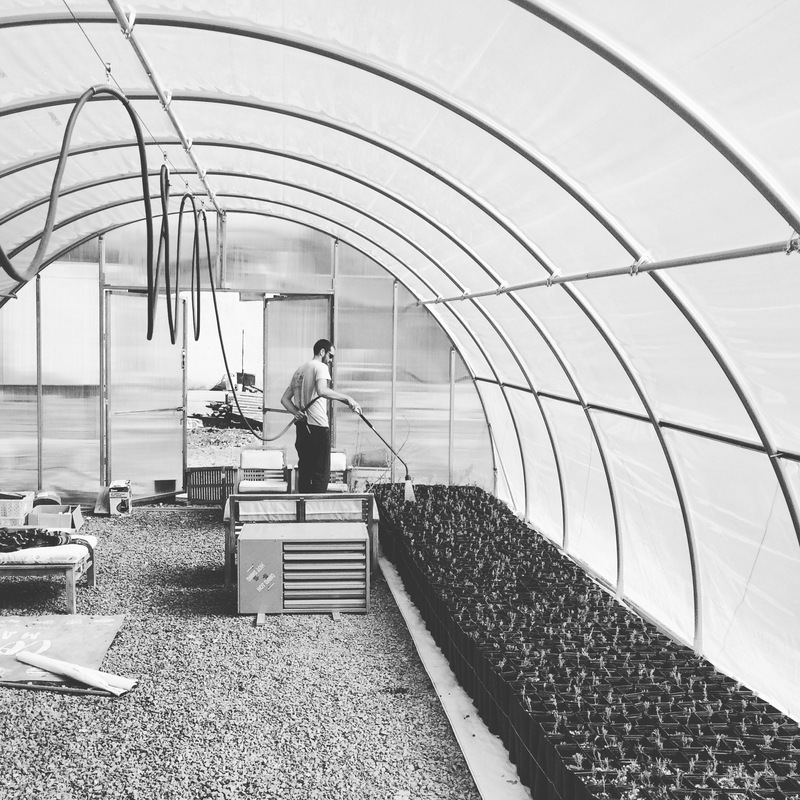 Now we’re using the placement of the high tunnel to lay out our planting beds for this coming season. I drew up hexagonal plant spacing for each bed and used it to calculate how many seedlings to start. 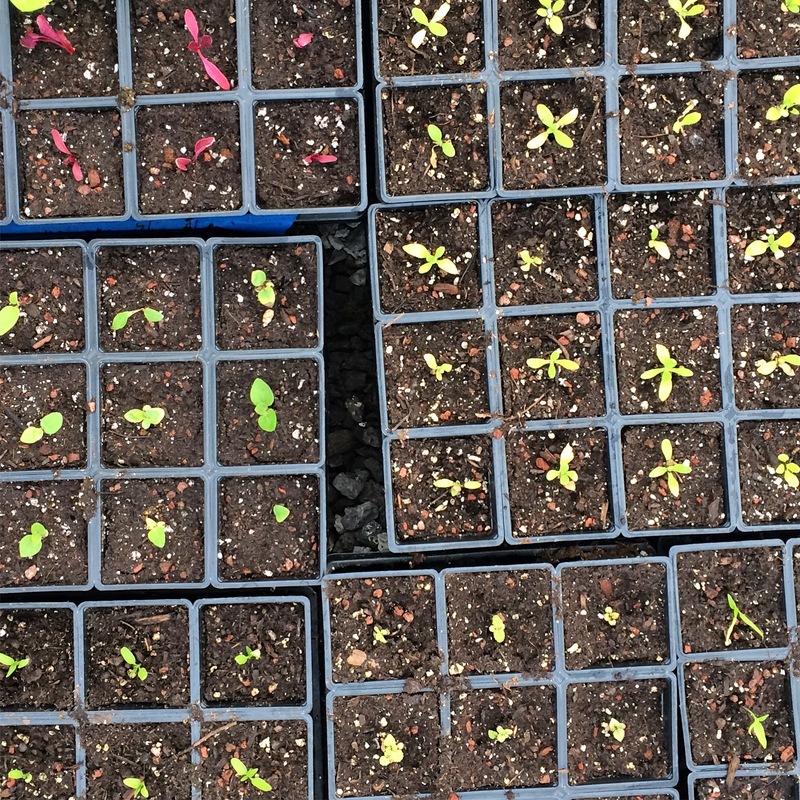 It’s been a little challenging to know when to start a lot of these seeds since we need to have some ready for our first event in mid-April but our planting out date for frost-sensitive plants won’t come for a few weeks after that. I’ve just been working really hard to keep detailed records. We’ll do the best we can with what we have this first year and with enough notes, we’ll be so much wiser when it comes time to do this again next season. Those two ideas have been my mantras through this planning phase. It always feels like we’re behind the curve and behind schedule. Deep breaths! Move ahead! And take detailed notes!!! And then there were mice. After several days of moping that we lost so many seedlings, I put myself back together and got excited about planting anew with more appropriate numbers. And now I’ve discovered that I have inadvertently created a five star mouse retreat. It’s the bleakest time of year and here we have this warm cozy little spot with a breakfast bar of seeds that gets replenished every day! Those crazy little rodents dig up each seed leaving a mess all over my neat, carefully labeled trays, and eat half the seeds right out of their shells. It looks like a massacre. A mysterious, tragic massacre. It took me a few days to understand what was happening, and my first reaction was devastation and rage. And then I tried to imagine those furry little guys coming upon this feast and holding my precious seeds in their teeny tiny little paws and thanking the heavens above for their unbelievable luck. It’s a little less painful when I think of it like that. But then I set mousetraps… because the world is cruel and confusing. Almost a year ago we built this awesome new chicken coop into the same structure we built to house our alpacas, our tiny hay barn, and our planting benches. Only… we never finished securing it against predators. And the chickens never got the memo that it was where they were supposed to sleep. And we never did much about it, because for a year we hadn’t seen any evidence that raccoons or any other critters had been bold enough to come into the yard thanks to the dogs and alpacas. That changed a couple weeks ago when Kemper woke up to the sounds of raccoons. He went running out with Remy the guard doodle and chased them off, and we collected all the sleeping chickens within reach and had them spend the night in a teeny cage in the kids’ bathroom. 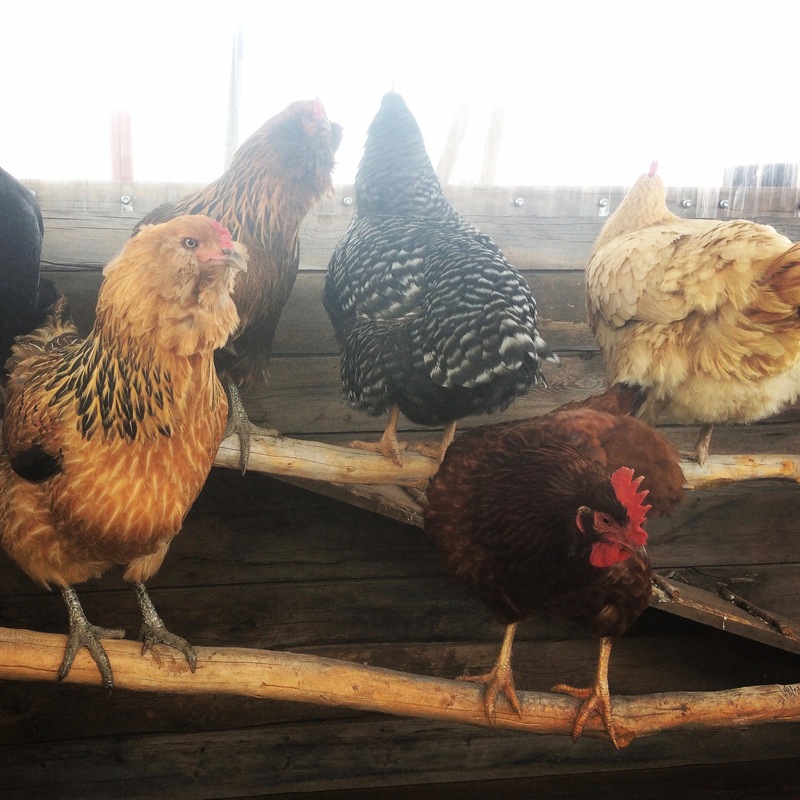 Miraculously, all ten chickens were accounted for the next morning. 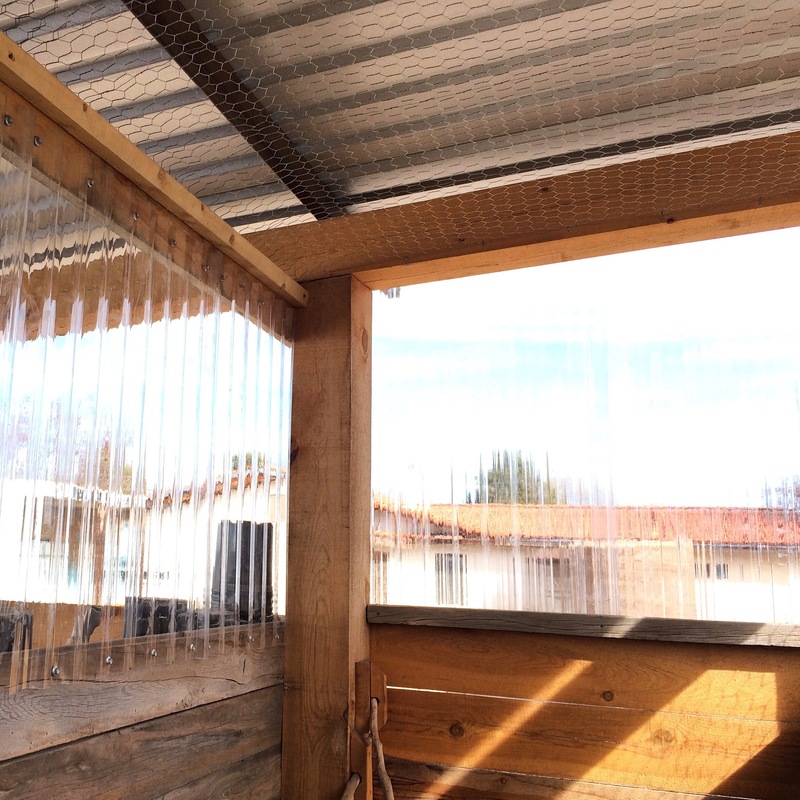 We spent the next two days installing chicken wire and transformed the place into a fortress. 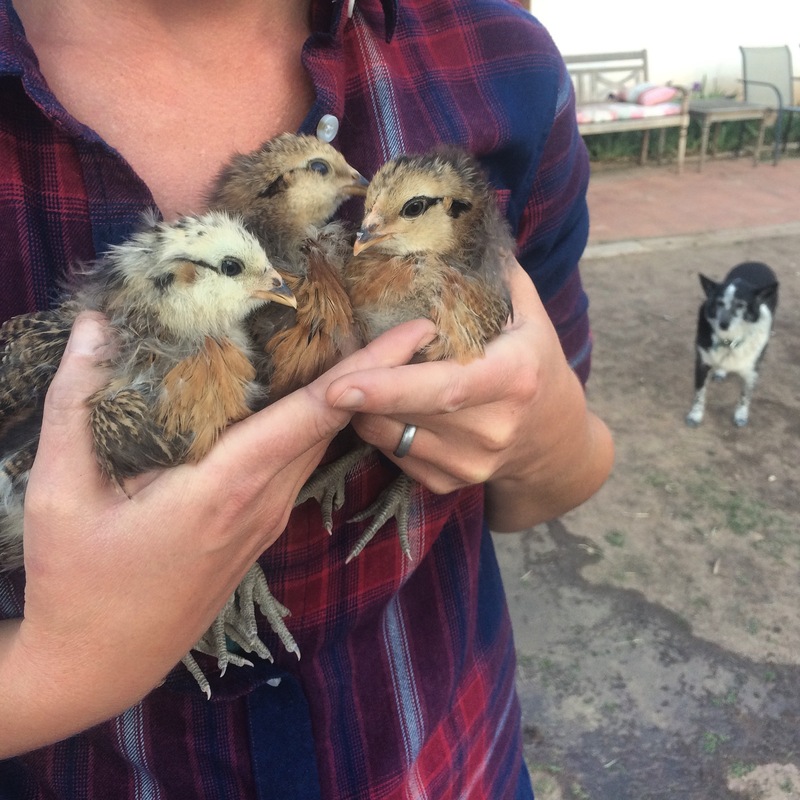 Now, with the irresistible lure of chicken scratch every evening at sundown, we’re finally getting those ladies into the groove. Week Twenty-Two – When’s Winter? The snap peas are finally producing! They’re still only about 18″ tall but, full of delicious little peas. The radishes, meanwhile, went quickly from delicious to pithy and bolted. I harvested and ate as many as I could and sorta thought I could let them hang out in the ground and keep pulling them as needed, and then all of a sudden they were all goners! In the fall I’ll try to do small batches planted in succession and continue that throughout the spring. For now, though, we’re leaving the flowering radishes in place. The bees are loving them, and if we get a few volunteers out of it, we won’t mind. I also pulled a few carrots and they’re petite but normal-shaped and sweet and tender and DELICIOUS. I have a feeling we’ll be swimming in them soon, and I plan to cut some into coins to freeze for steaming later, pickle some, and eat and eat and eat them fresh! 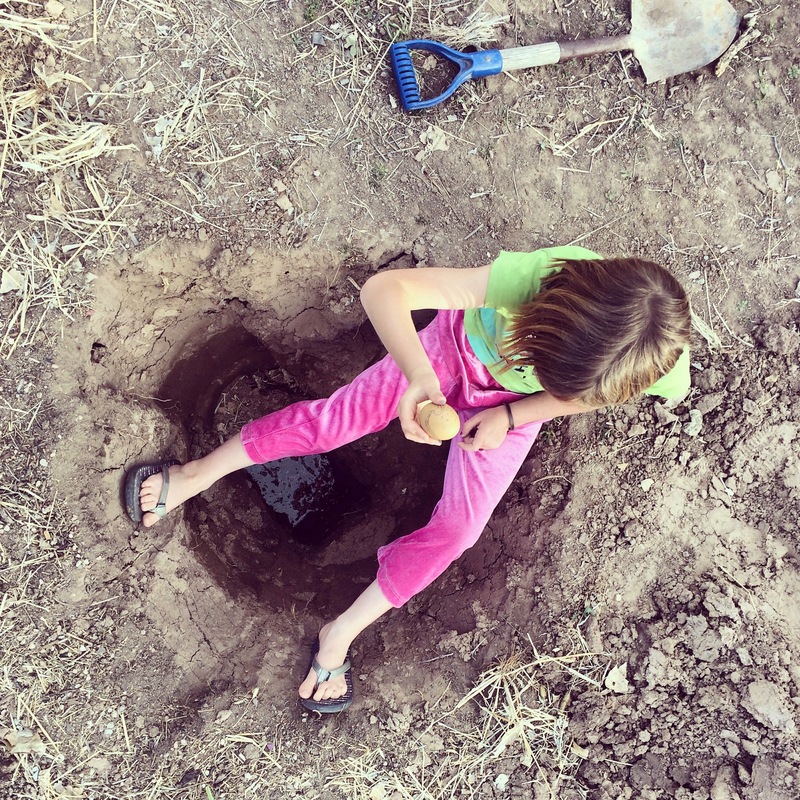 The broad-forking plus alpaca manure plus addition of loose sandy soil seems to have overcome the hard-pan-clay troubles we’ve run up against in the past. Molly M. came down two weeks ago to help us clone for a while and the next week I went over to her place and helped her move a big compost pile. Her farm inspires me every time. She produces so much delicious food in her third-acre. No tractor. Just good practices. And she lent me One Straw Revolution, which was a great read! Lots in the book that applies very specifically to the climate of Japan, but nevertheless there were some great principles that would apply anywhere. He laughs at people who make compost. Instead, he just puts the rice straw back after threshing and lets it compost in the field. Might not work so easily here with our limited moisture, but I love the idea of interfering less. The cloning is progressing. The propagation-tunnel had to be modified to half its planned size because we didn’t have enough plastic to cover the whole thing, but it seems to be working well! 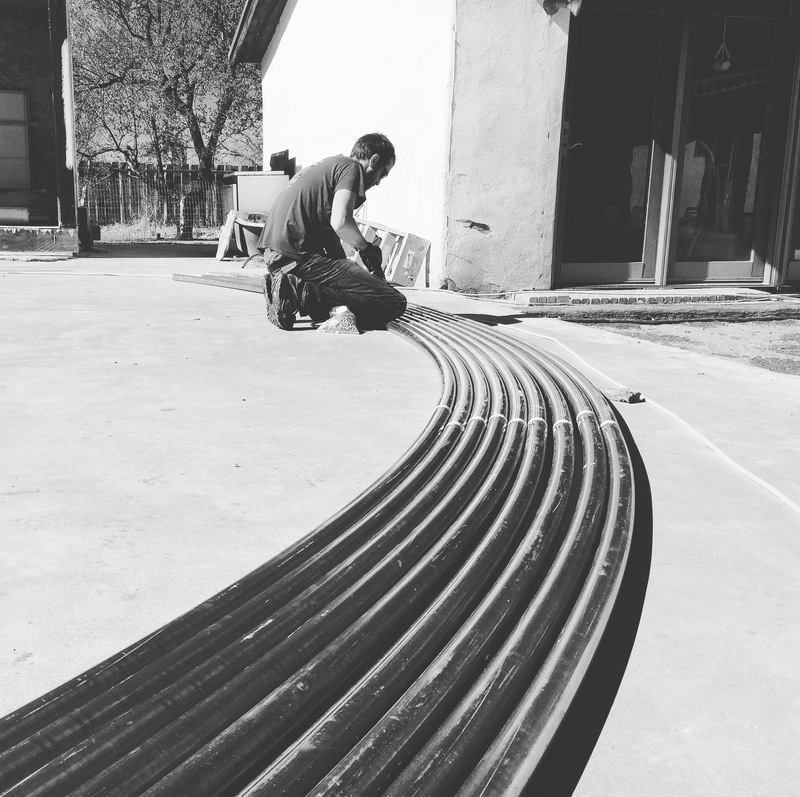 Molly helped us get a nylon cord wrapped over the top and we hung a few micro-sprinklers from the spine of the tunnel. Markets have been going pretty well despite our insane lack of preparedness. We’re doing half the booth with BlueFly stuff and half promoting the Community Farm and the Maze. Our laser-cut plant stakes are continuing to sell well and aaaaaaany day now we’ll be able to start harvesting lavender. It’s sending out tons of gorgeous buds. 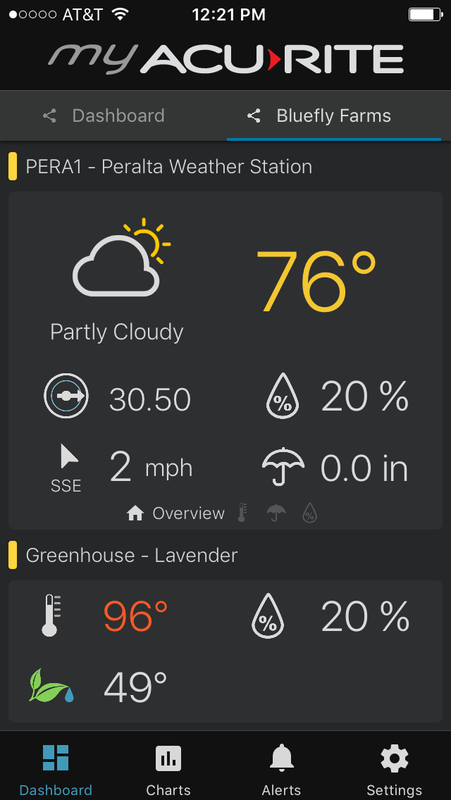 And meanwhile, in the heat-island that is Albuquerque, we see lavender in full bloom everywhere we go and must work really hard at being patient. The alpacas have been doing the most phenomenal job of keeping the field clean and trimmed. They were given an enormous head start, of course, by Kemper, the mower, and the weed-whacker, but as things are greening up there are hardly any weeds creeping their way into the plants. I’ve sworn for the past two years that we’d do a good hand-weeding right before harvest so we don’t have to pick out as much from the lavender once it’s cut. And it looks like that might actually be manageable now! And *knock on wood* the salsify hasn’t had a chance to come up out there meaning we hopefully won’t be picking those fluffy little seeds out of each bundle! We DESPERATELY need more secure fencing. 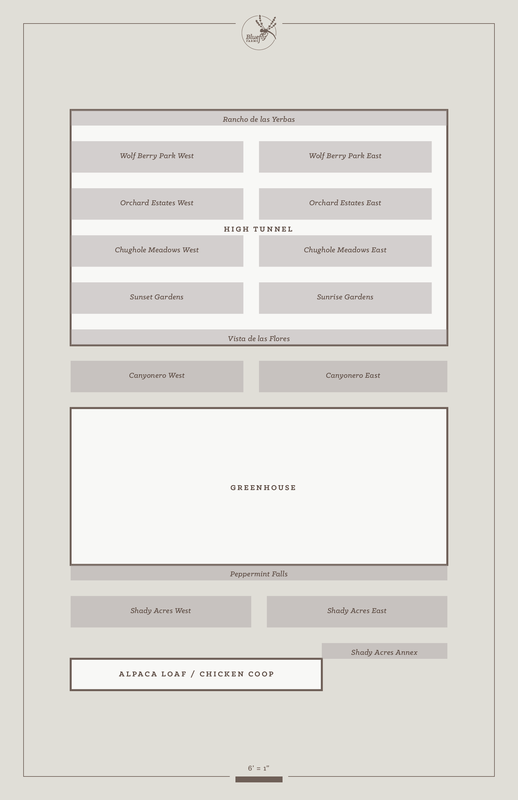 And a better layout. Right now the alpacas’ favorite place to hang out (and poop) is the small courtyard area right outside our front door. And while it’s hilarious to wake up in the morning and see them chilling right out the window, it’s not so awesome that they’ve eaten every green thing there down to nothing, and the poo pile… well. So we need a fence that keeps them just a hair further from the house, and also a more secure one around the back. 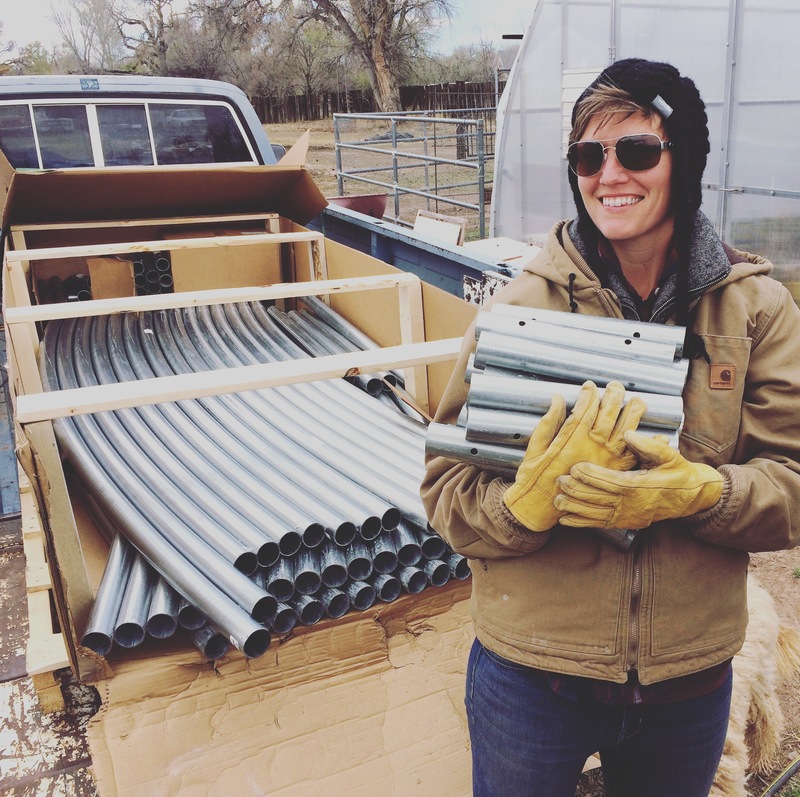 An alpaca-proof, dog-proof, giant-steer-proof, non-chemical-leeching fence! Trouble is, that will cost thousands of dollars. Cue the NRCS funding to support our rotational alpaca grazing. And then cue the news that our amazing, super representative at the local NRCS office is gone. We were supposed to get contracts and be able to start work in April. It’s now June. We have a meeting next week. Fingers crossed we can get rolling after that. We also desperately need the micro-sprinkler system! Still waiting on the shearer. Hoping he can make it this coming weekend. These boys look hot! They spend a lot of the afternoon loafin’ in the shade. The rye in the garden rapidly got taller and thicker and started going to seed. Kemper mowed it but it was impossible to get around the corners of the beds and between the garlic that’s still all over the place, so there are some place we’re still taking it down by hand. He wishes we’d done clover only. Hopefully in the long run it helps the clover get established better and we won’t spend the rest of forever fighting rye grass in the garden. 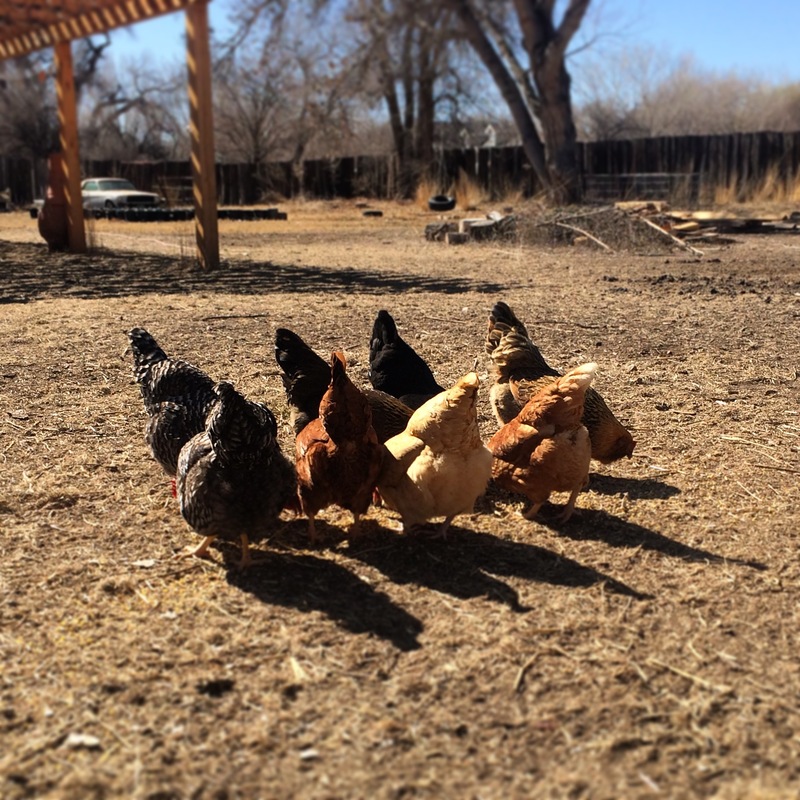 The baby chicks are roaming free and their travel is growing day by day. 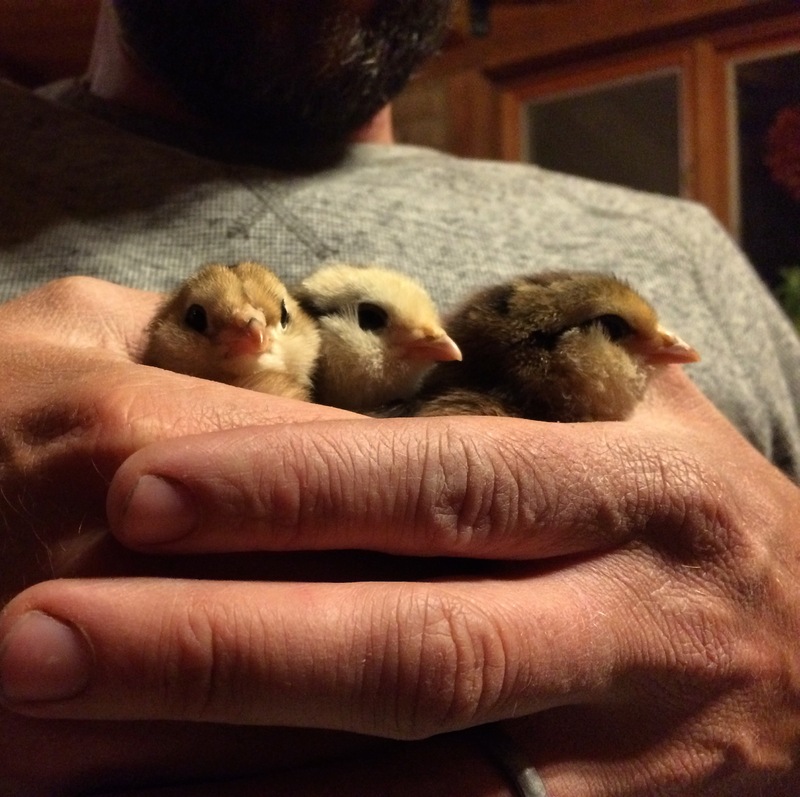 I’ve been trying to put them in the new coop when it’s just dark enough that they won’t try to relocate themselves. No idea how long (or even if) it’ll take to get them to go there on their own. But I do enjoy tucking them in at night. A week ago we planted the tomatillo, eggplant, and tomato starts into the bed that the sweet peppers were massacred in. Must have been too cool, because everything in there now is happy! A bit disorganized, though, since I was planting around the mysteriously-still-green stems of the peppers hoping they might somehow make a miraculous comeback. We also decided this time to leave the mulch off so that the dark soil can absorb the sun and stay warm. Who knows if that would have made enough difference for the first batch. Been debating naming that bed Pepper Deathwatch or Winter Wasteland instead of whatever crappy subdivision name it was destined for before. Sunset Gardens? Orchard Park South? This past weekend (Memorial Day) we got a few more beds broad-forked, added magic alpaca beans, threw a layer of the Soilutions mix (compost, wood chips, sand, and perlite) on top and planted lots of the remaining transplants—green chile, Jack and Evie’s flowers, and cabbages which will likely just bolt since it’s so late and hot but I put them between a trellis of peas and a row of garlic so they might have a chance with a little shade and mulched them to try to keep the soil temp down. Then we put up another row of trellising and planted Scarlet Runner Beans (my first saved seed!) and I broadcast the onion seed I never started in the bed beside them. I have severe doubts that I’ll get even a single onion, but the seed doesn’t store well, so there’s really nothing to lose! I also planted new carrot seed in between the beets that are almost ready! I’m daydreaming of a plan that lays out how often to plant a new section of something based on the season and how much we can eat at a time and also magically considers good companions and times when overlap like that with the beets and carrots would be beneficial. With as much space as we have out there we could be growing a TON of food. We just have a lot of kinks to work out on our way. 1400 down, 5200 to go! The 200-plug deep trays arrived Monday and we picked up soil and sand Tuesday and started cloning. 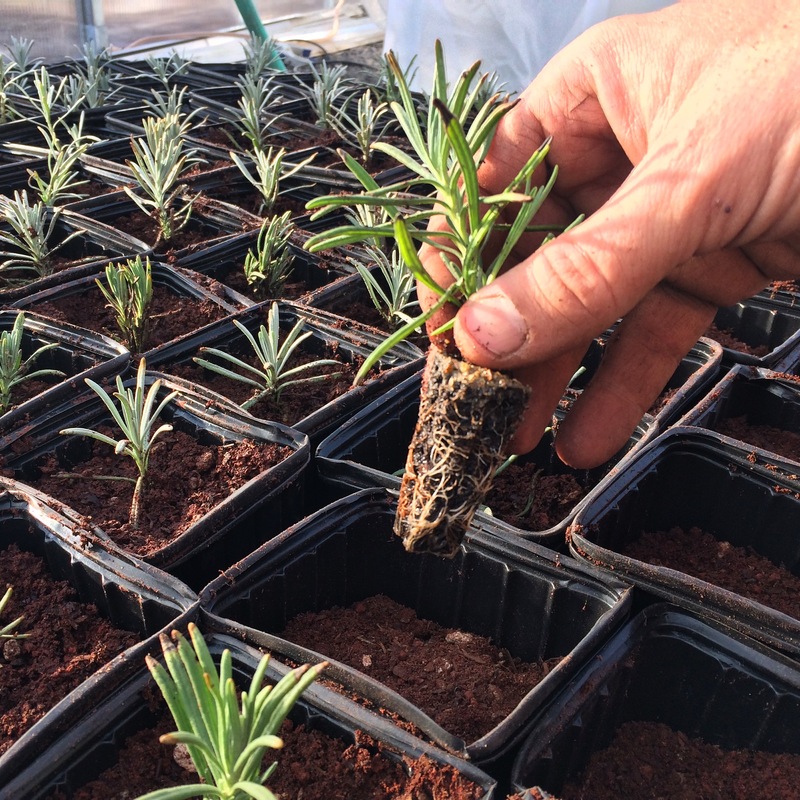 We’re taking small cuttings and inoculating them by dipping them in willow tea before placing them in the trays. We managed to get seven trays done before the kids returned and monopolized the morning and evening hours. Meanwhile, of the nearly ninety peppers we planted last week, all but three were dead two days later. We’re not sure why. Too small? Too hot during the day? Too cold at night? They just wilted almost immediately. It was so tragic. I’m glad at least that we only planted one bed. We’ll wait longer before putting anything else in the ground and we plan to get the remaining starts out into the tunnel as soon as it’s ready. 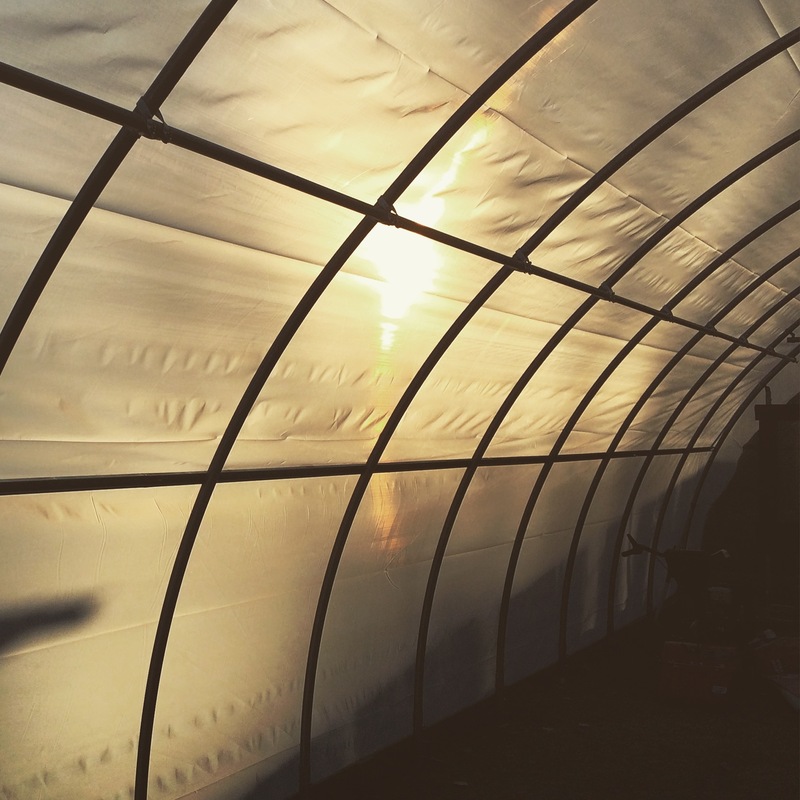 And speaking of the propagation-tunnel, it’s almost ready! We leveled a section of the garden to the far west where it will start getting some shade in the early afternoon and covered it with leftover weed cloth. We bent seven lengths of conduit into frames on Sunday and today I got the stakes in place and fitted the ribs over them. 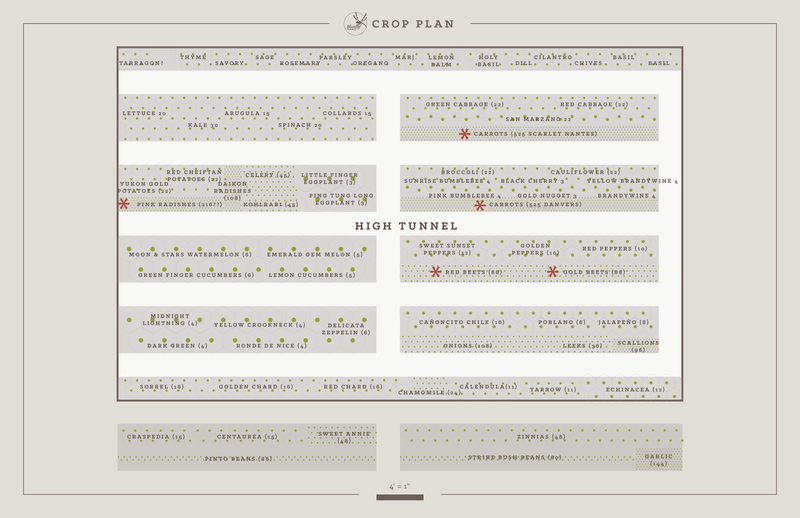 The whole area will be 24′ by 6′ (enough to fit the clones when they’re in small trays, along with our vegetable starts.) Next step is to affix the plastic! Saturday William Colburn, Michael Reed, and I trucked down to Ladrón with Robert to see the land and look at possibilities for restoring it and growing on it. It was a gorgeous day with enormous storm clouds that rolled in as we walked. We looked at the plants growing and the evidence of stormwater patterns and absorbed as much as we could. Hopefully by tomorrow we’ll be letting the alpacas into the lot to the north to graze. We need to finish putting up a couple small fences to protect their young cottonwoods. I cannot wait to watch them run out into that new green territory. They’re going to go bananas! The madness started Thursday with the UNM Sustainability Expo, which meant we were running around all day and night on Wednesday trying to get ready and remember how to pack up for outdoor events. I worked for hours on sewing little pouches stuffed with lavender from our feed and seed sacks, but didn’t get enough done to take them. We bundled up the last of the 2015 lavender harvest that had been carefully boxed away and took that along with all the plant markers and some notecards. Double-tabling for BlueFly and the Community Farm worked pretty well. We had another event for RGCF at Civic Plaza Friday evening (which was nearly rained out) and the Coop’s Earth Fest with both tables again on Sunday. The plant markers were a big hit everywhere and we sold all but three bundles of lavender. Sunday our table was next to Mandy’s Farm selling their eggs, vermi-compost (with my logo—yay!) and Alpaca Beans! Harvested the first few radishes from the garden! There were so bright and beautiful and juicy and yummy! And they grew SO FAST! Definitely going to plant more! And the peas are finally grabbing onto the trellises after a few weeks of hanging out at the same height. And while we were out there checking on all the plants we discovered raccoon prints in the mud. I didn’t think they were still getting in (thank you dogs and alpacas) but I can’t argue with a fresh footprint. Saturday we got all the sweet and poblano peppers transplanted in the garden. There are so many more than what I originally drew in my plan, but I also had them drawn a little too far apart. So there are nearly 96 plants in one 4′ by 22′ bed. I broad-forked it to loosen it, then Kemper added another layer of alpaca beans (he had added and turned in lots of them a few months ago before we covered the bed with a thick layer of alfalfa mulch) and then a layer of our Soilutions mix on top. It has a little sand, some partially composted wood chips, some compost, and some perlite. We mulched back over the top after all the peppers went in, and it looks gorgeous.